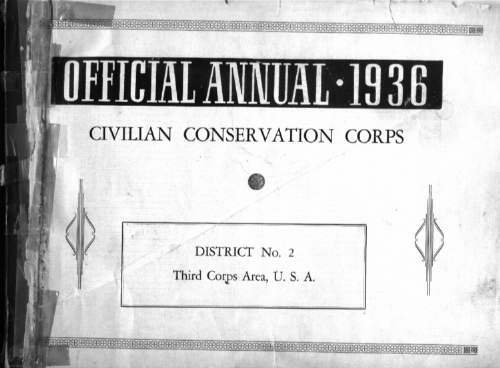 The pages in the above annual are listed below, in order with the exception of some two part articles where the first and following pages are listed together. 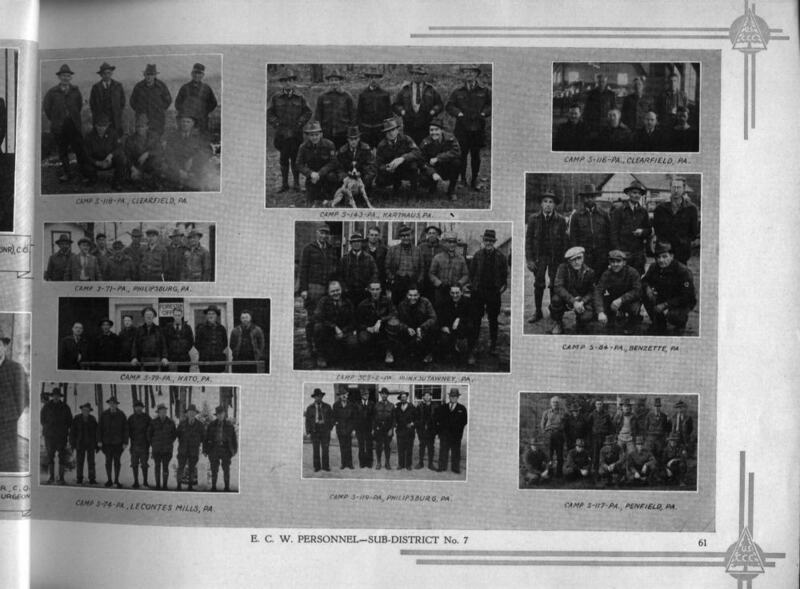 The above is the frontispage, the cover having been lost before my father obtained the book. 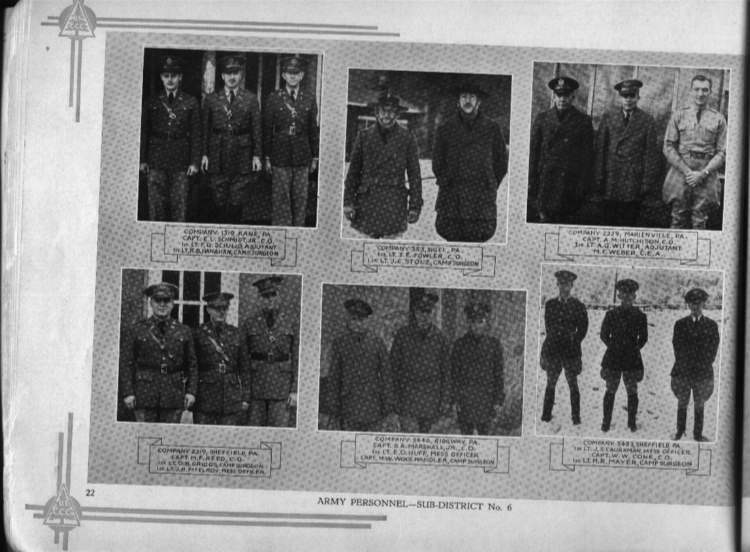 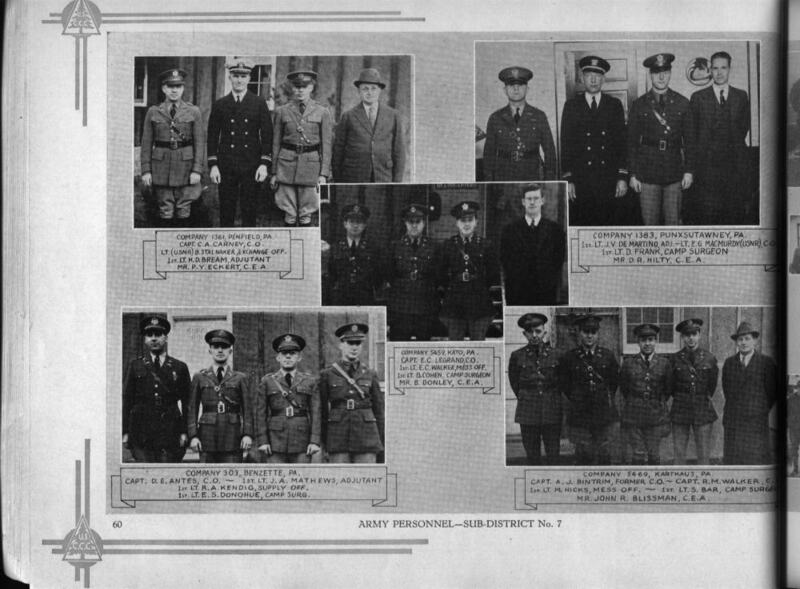 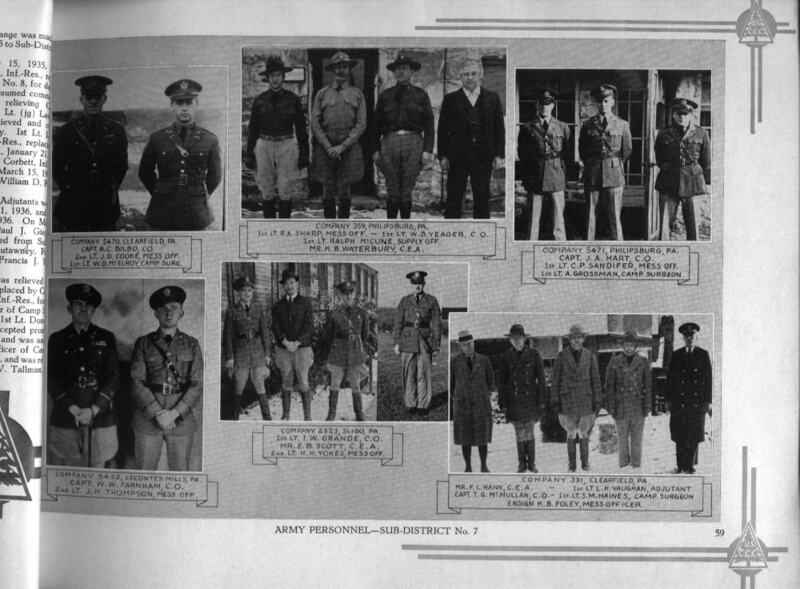 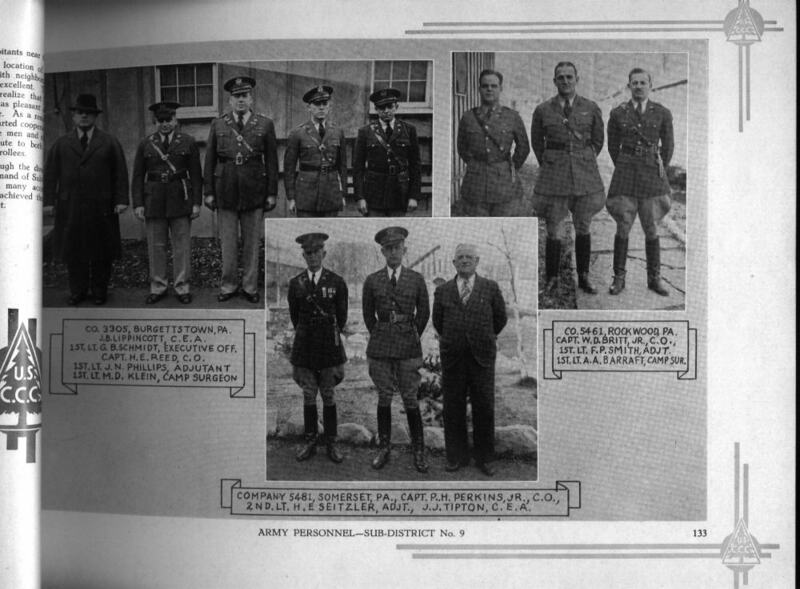 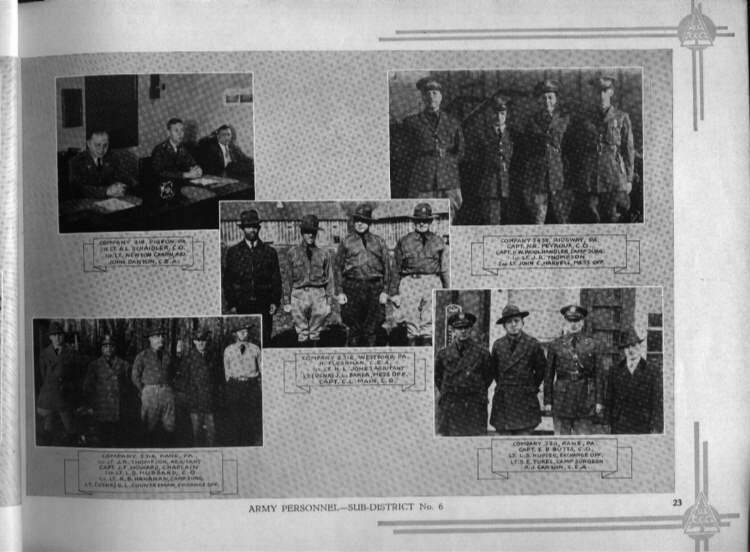 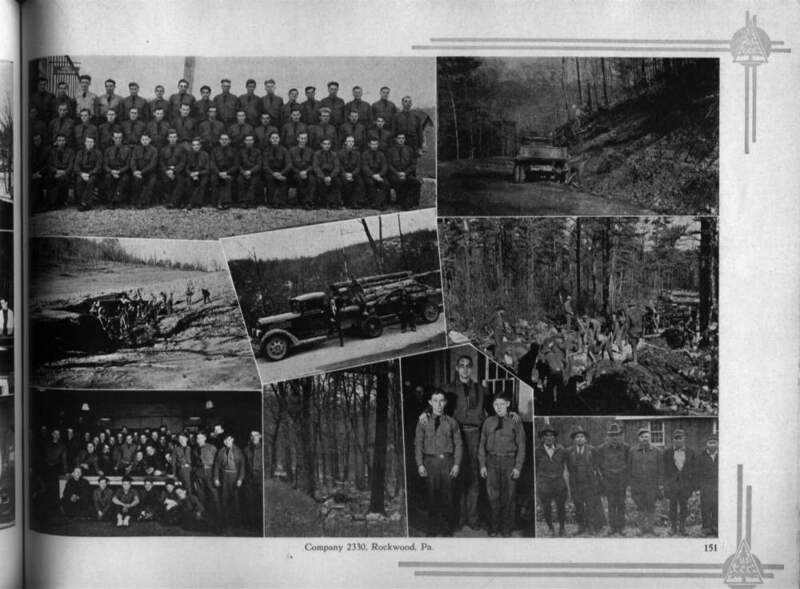 The book is a combination of unit histories, background information, biographies on the military staff and photos of the companies and their work at recreation. 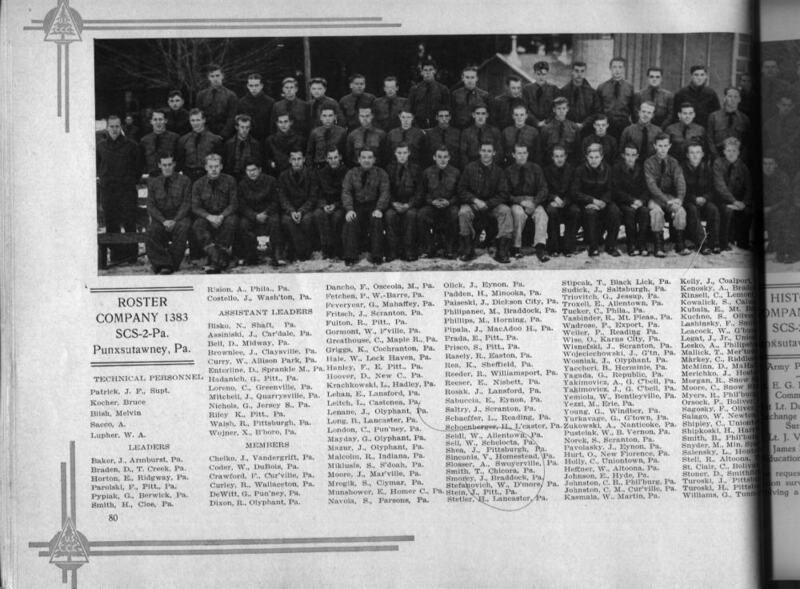 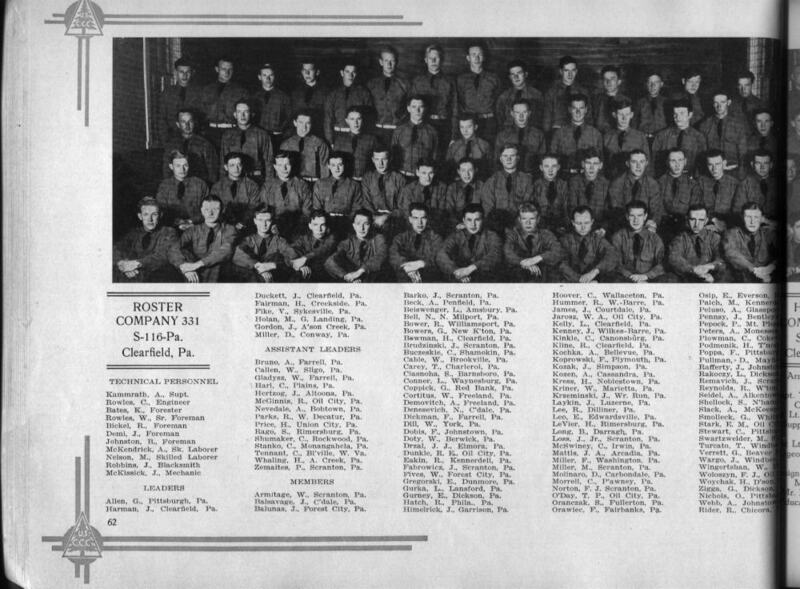 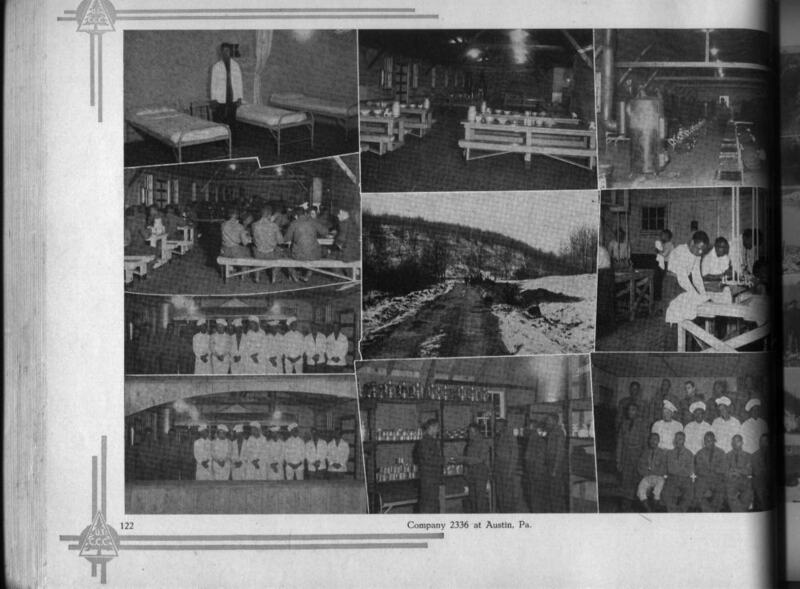 Activities of Company 331, Clearfield, PA.
Company 359 at Philipsburg, PA.
Views of Company 5471, Philipsburg, PA.
Sidelights of Company 1361, Penfield, PA.
Company 5469 at Karthaus, PA.
Company 5459 at Kato, PA. 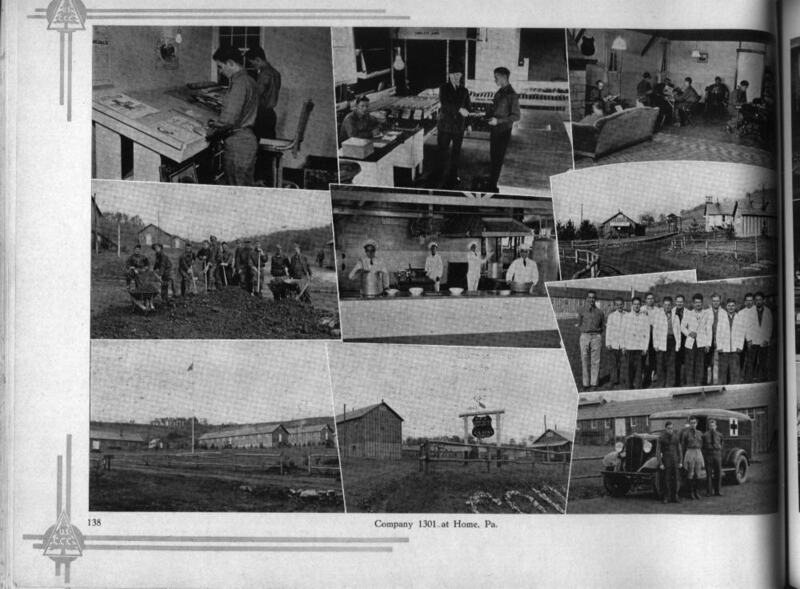 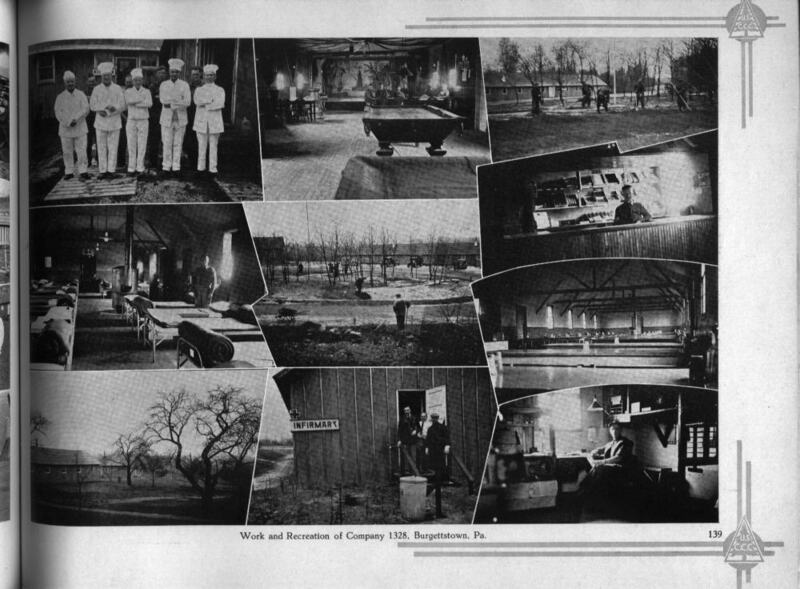 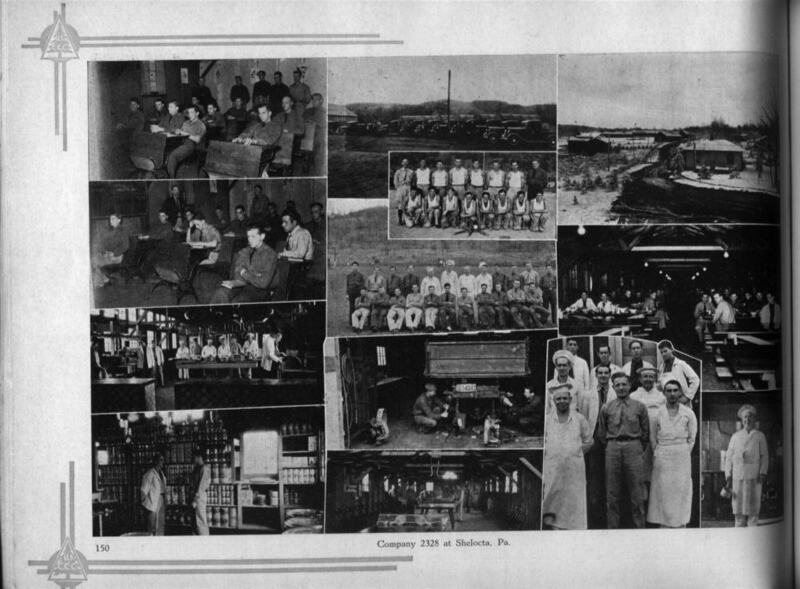 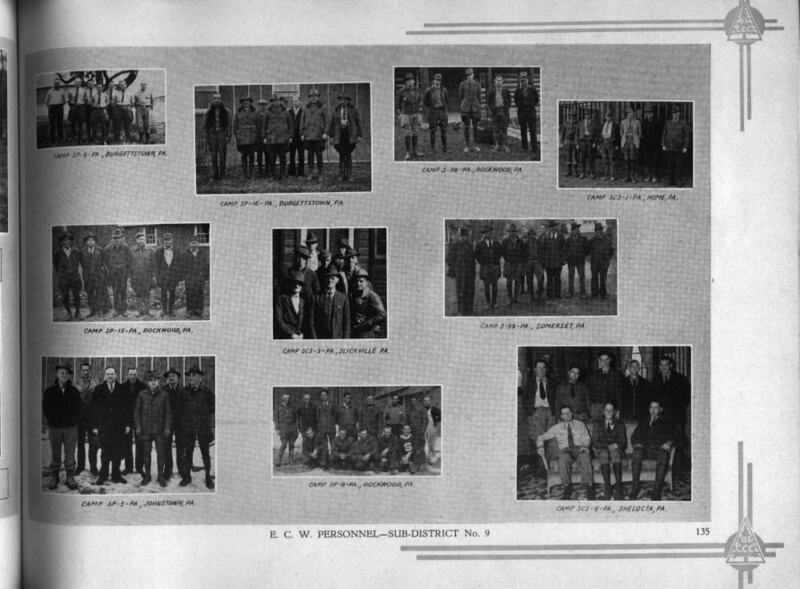 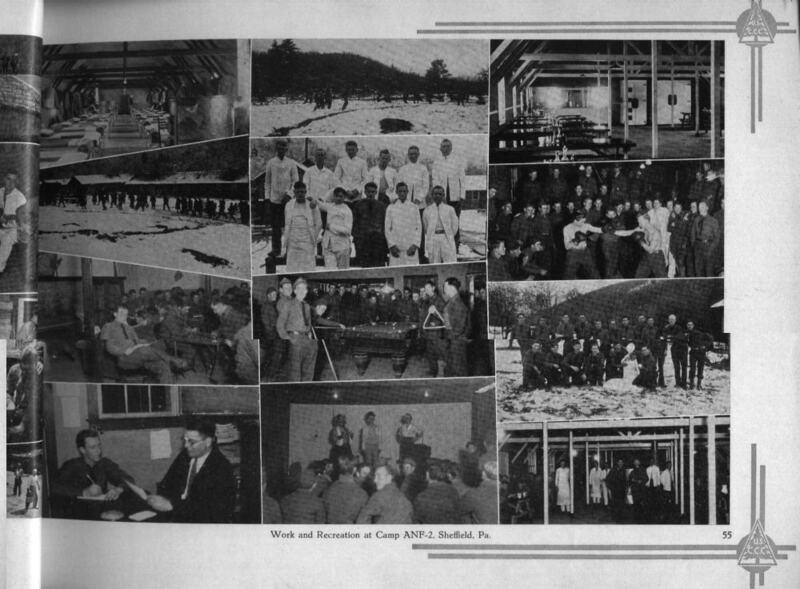 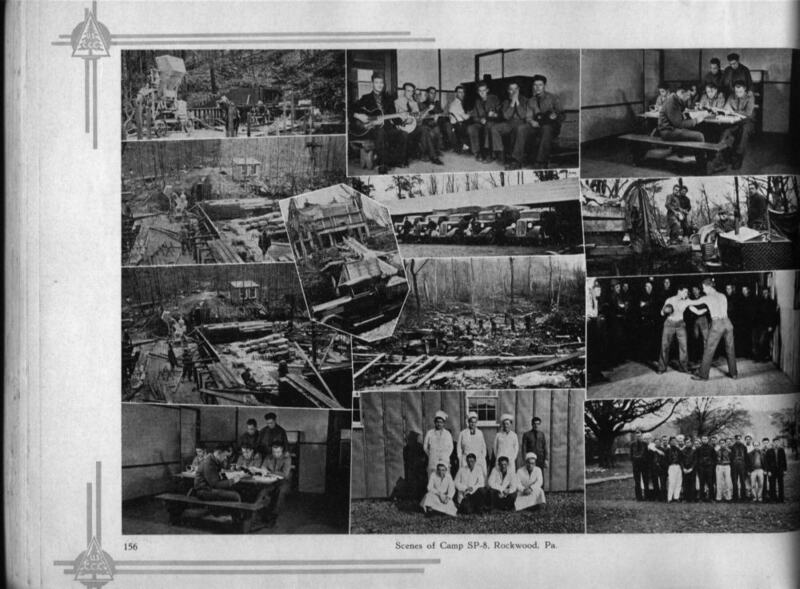 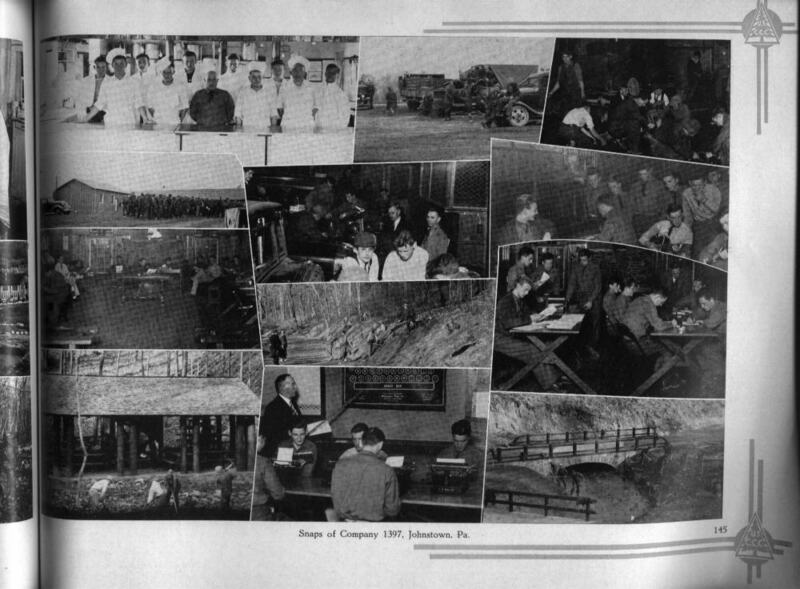 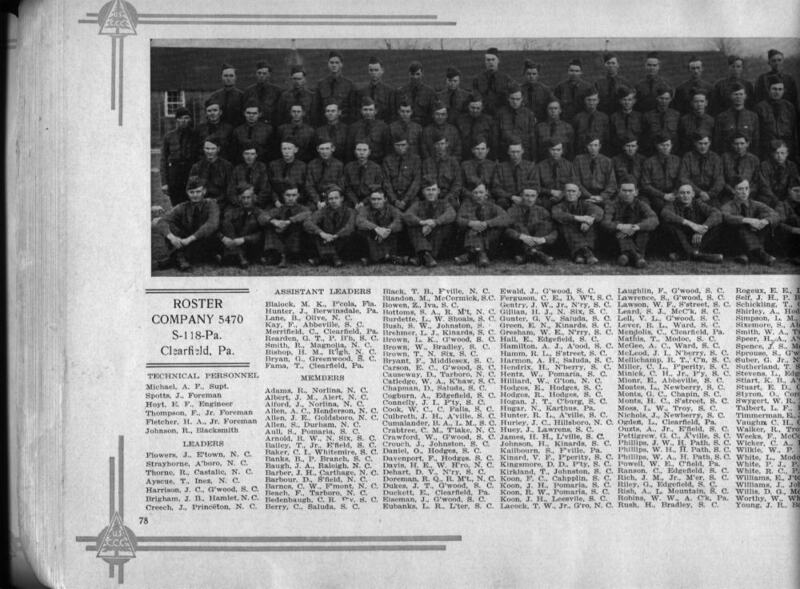 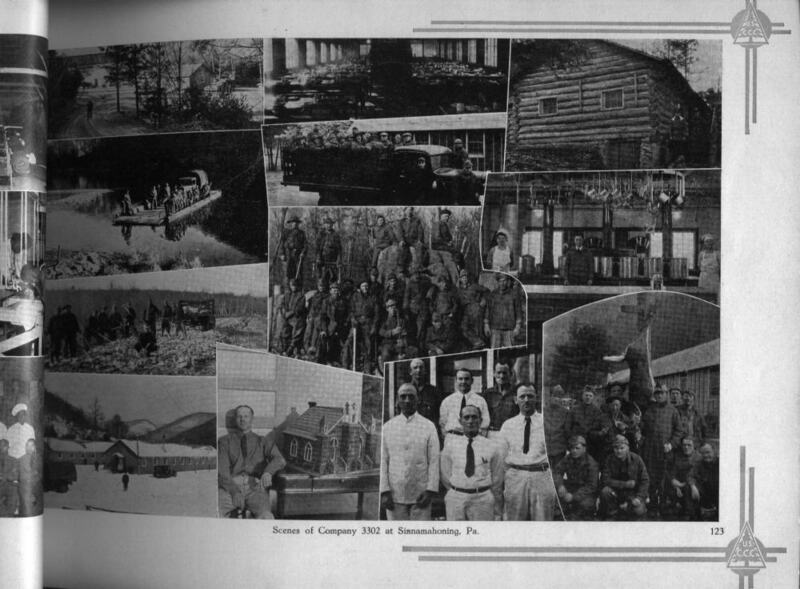 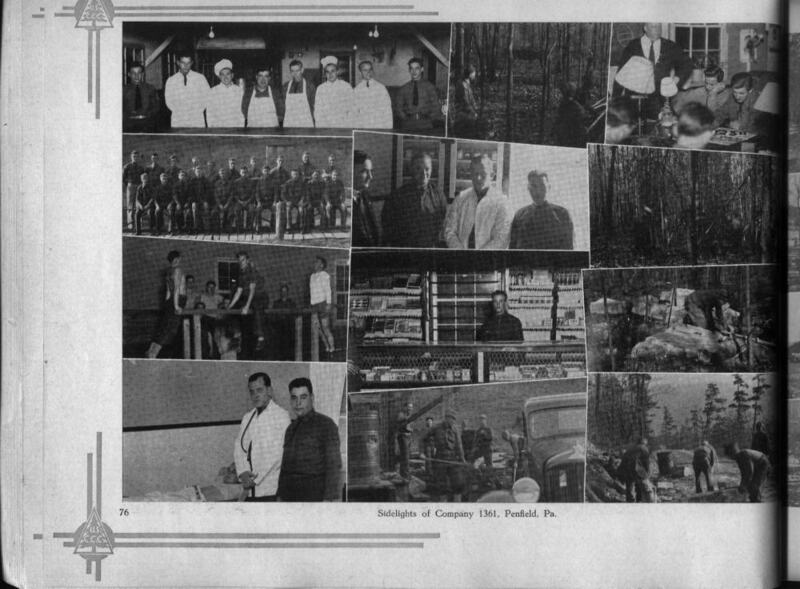 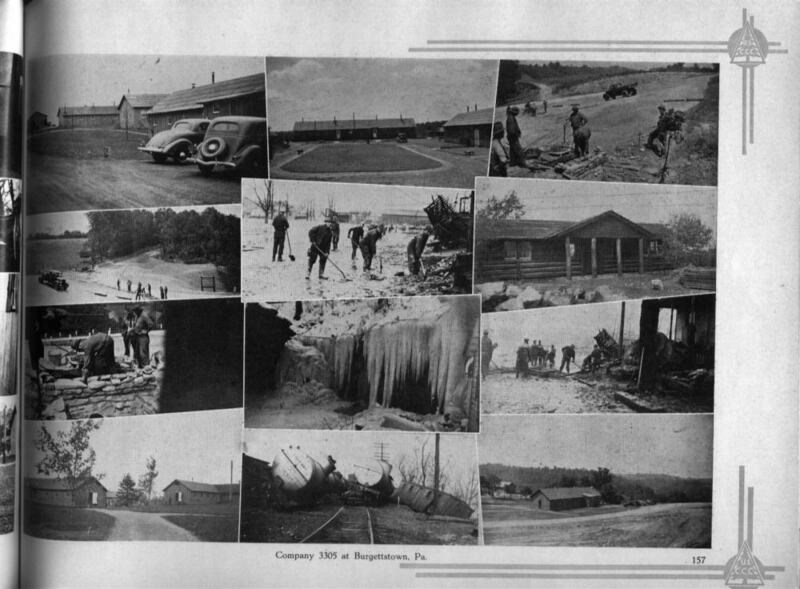 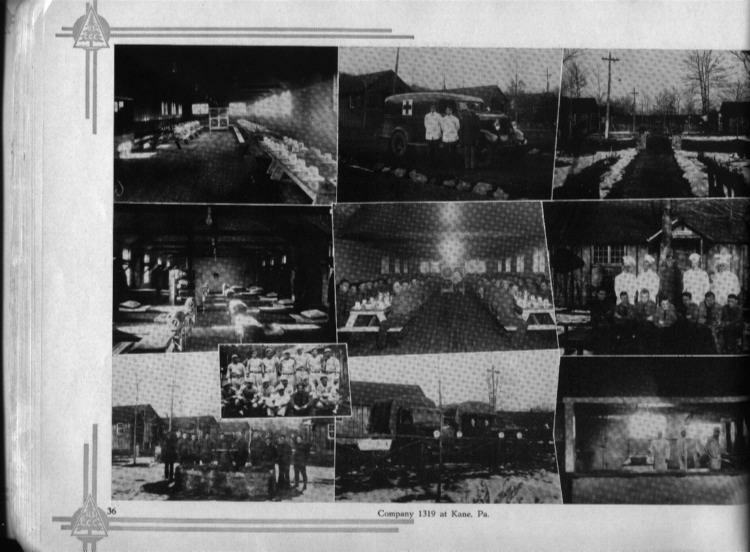 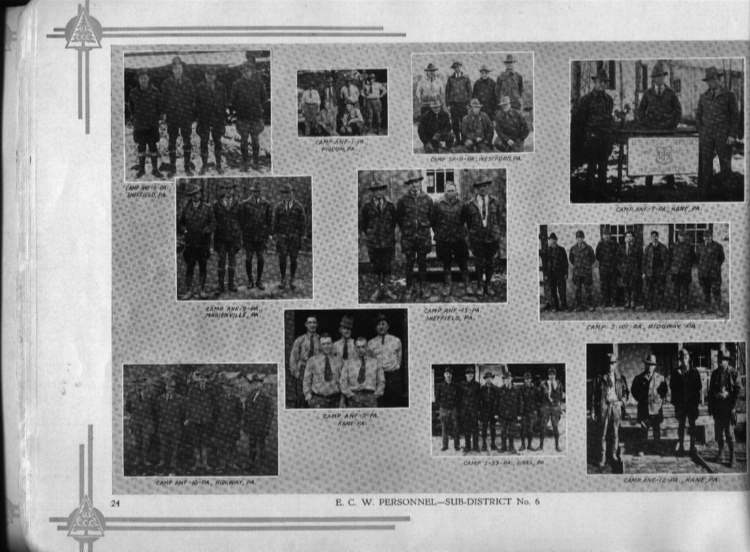 Interesting Views of Camp S-88, Galeton, PA.
Views of Company 321, Emporium, PA.
Sidelights of Company 380, Coudersport, PA.
Activities of Company 1321, Cameron, PA.
Snapshots of Company 1330, Renovo, PA.
Snapshots of Company 2325, Emporium, PA.
Snapshots of Company 2327, Westport, PA.
Company 2326 at Austin, PA.
Snapshots of Company 3302 (V), Simnamahoning, PA.
With the Men at Camp S-136 at Galeton, PA. 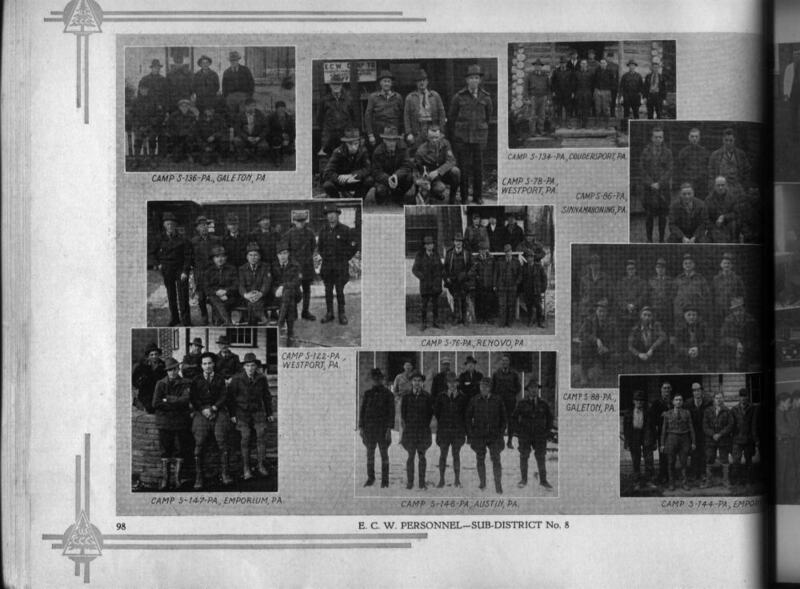 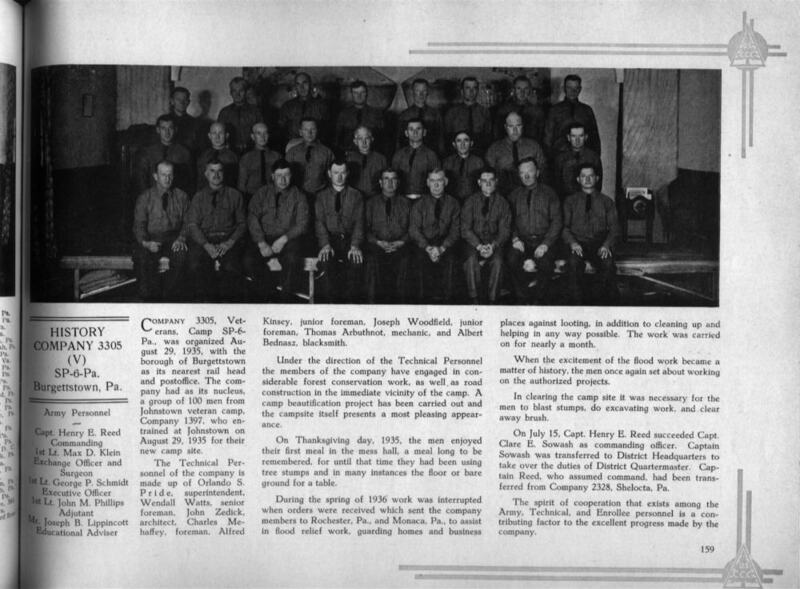 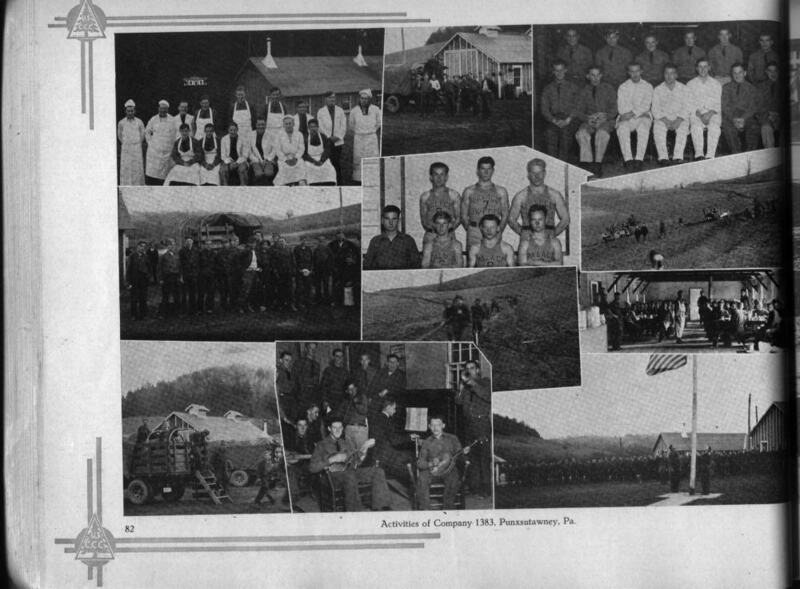 Personalities of Company 5450, Westport, PA.
Company 1301 at Home, PA.
Work and Recreation of Company 1328 (V) at Burgettstown, PA. 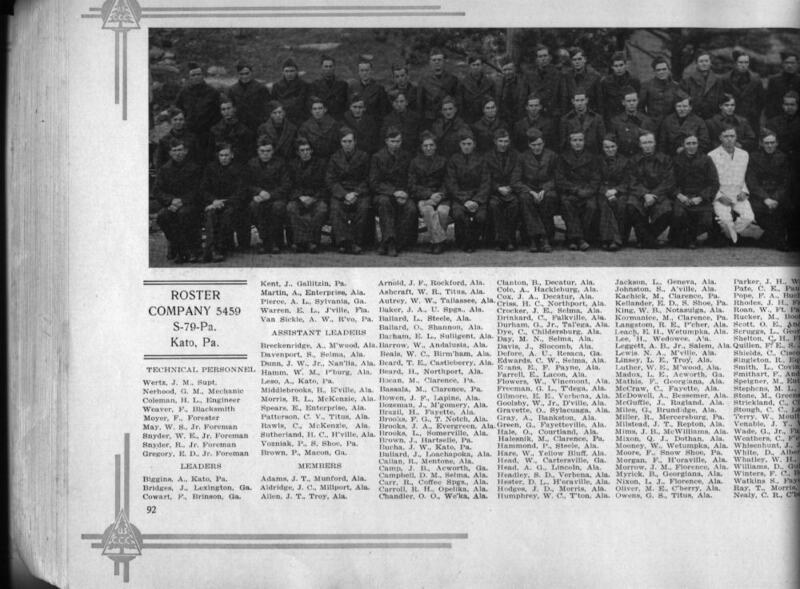 Interesting Views of Company 5481 at Somerset, PA. 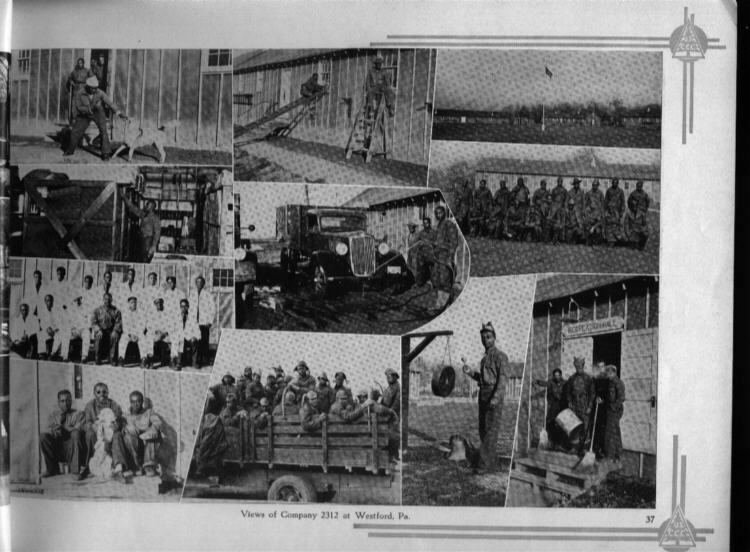 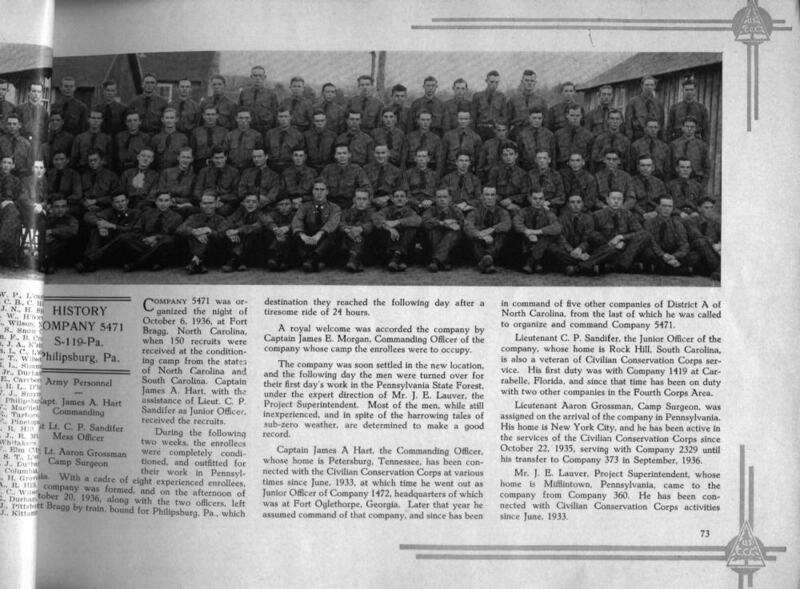 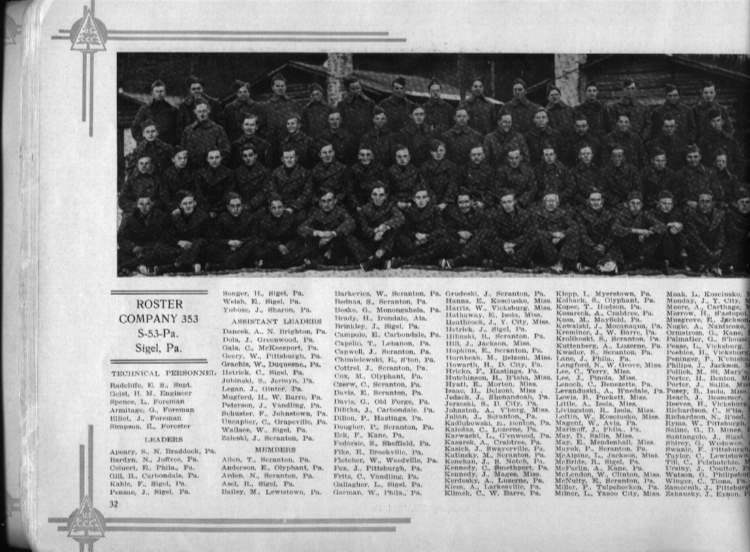 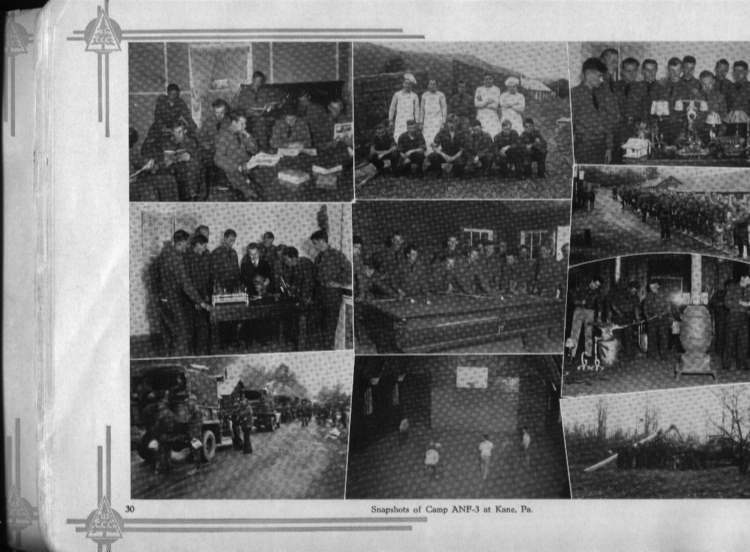 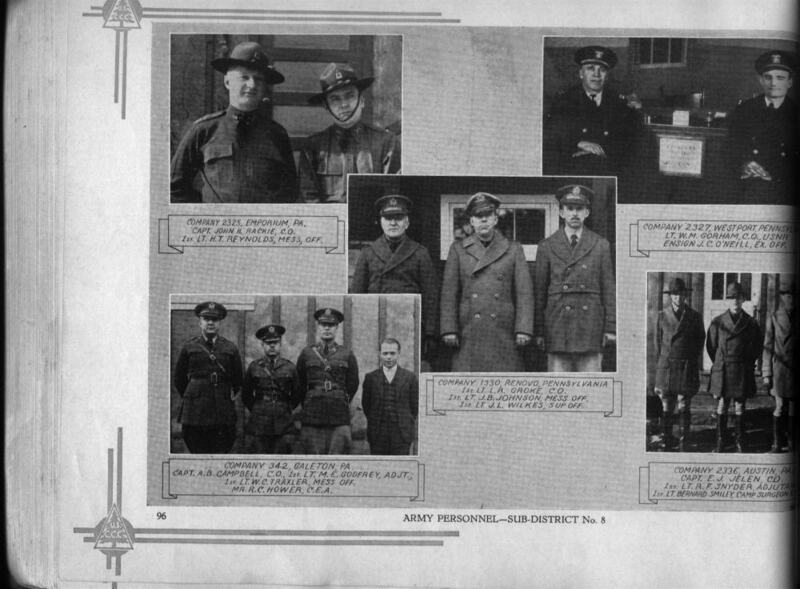 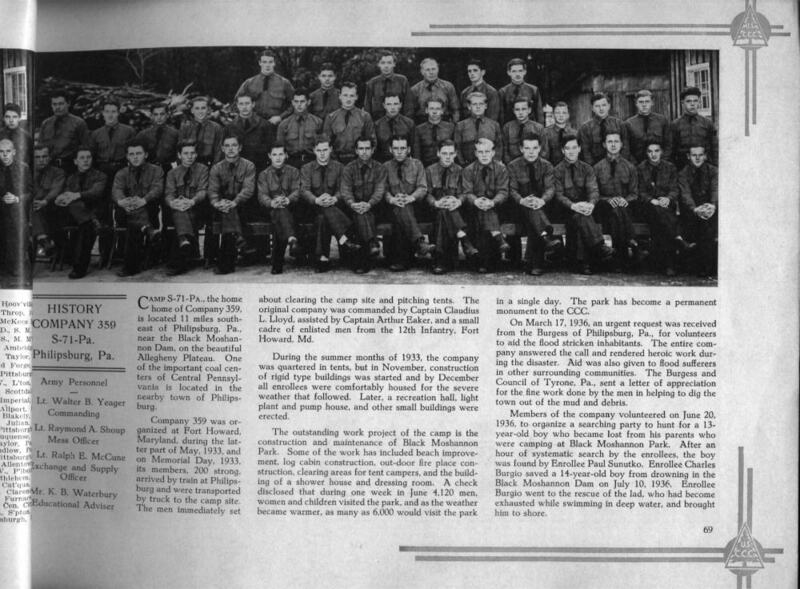 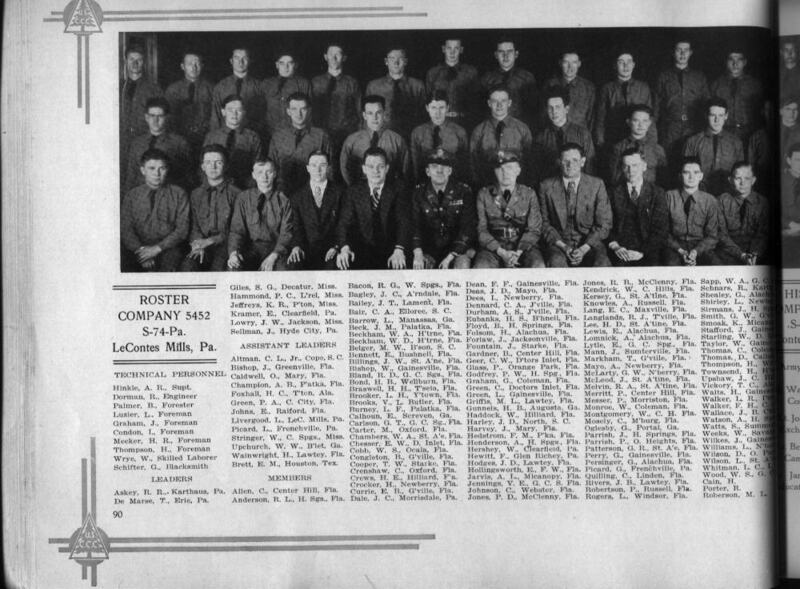 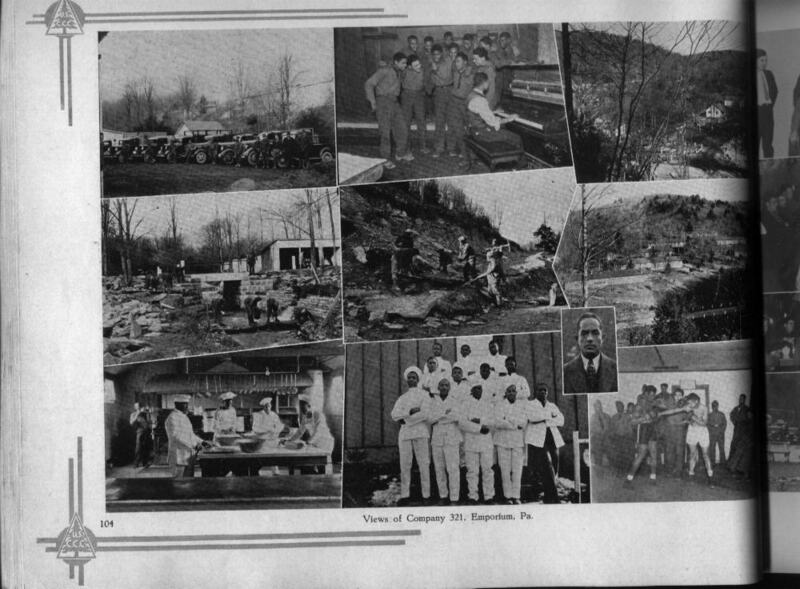 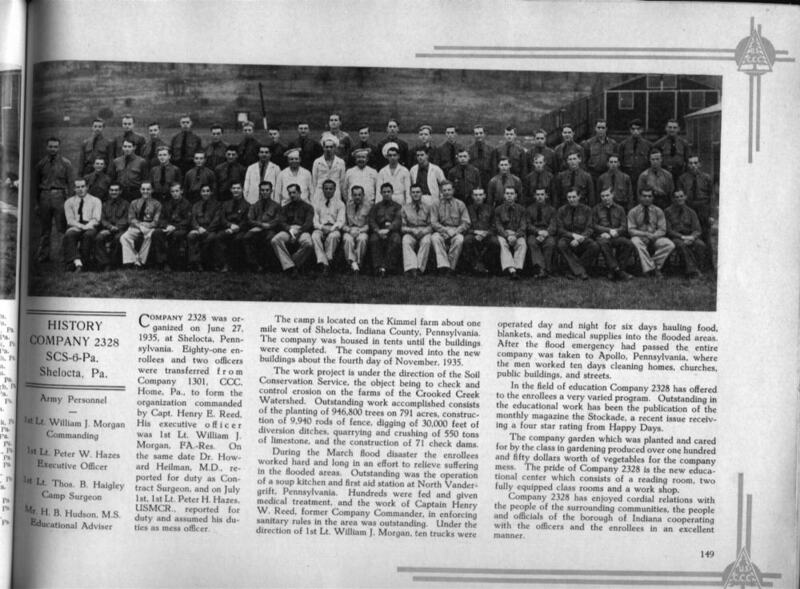 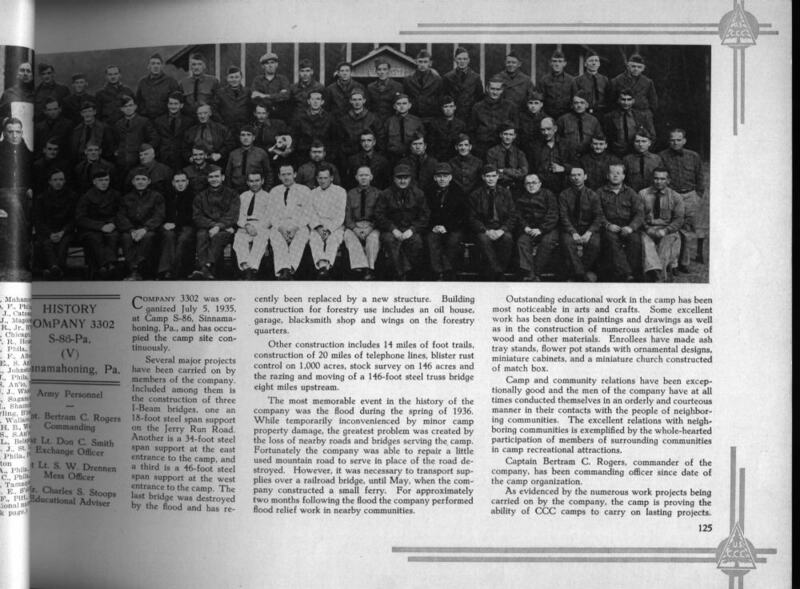 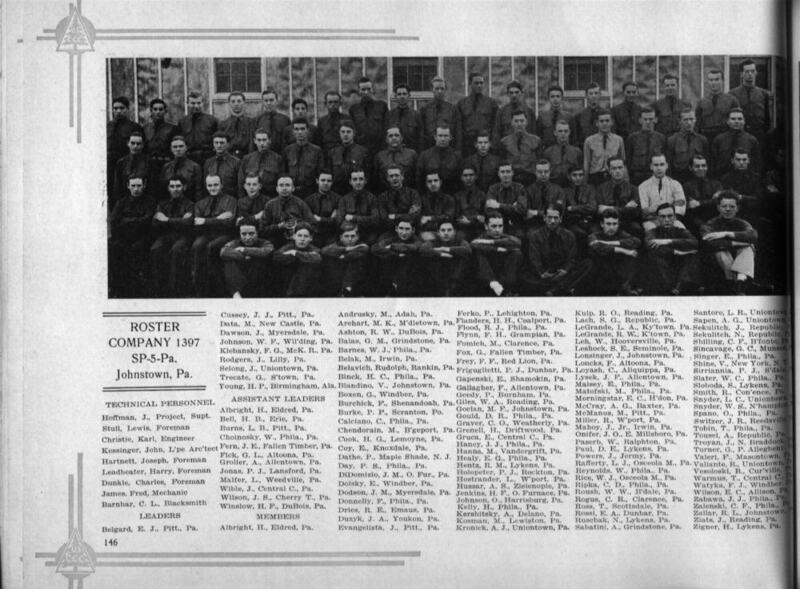 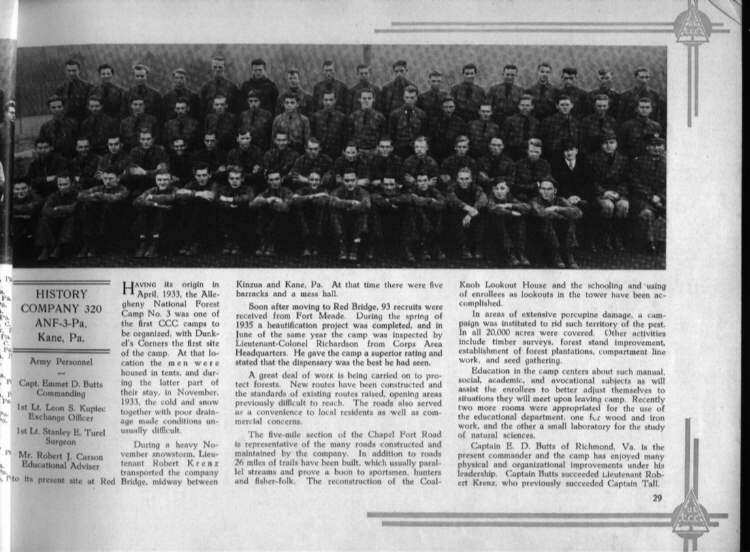 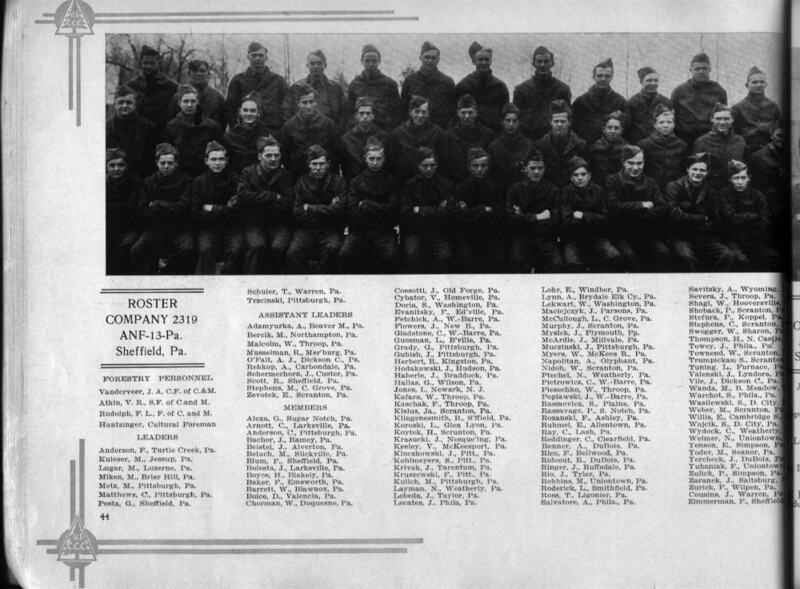 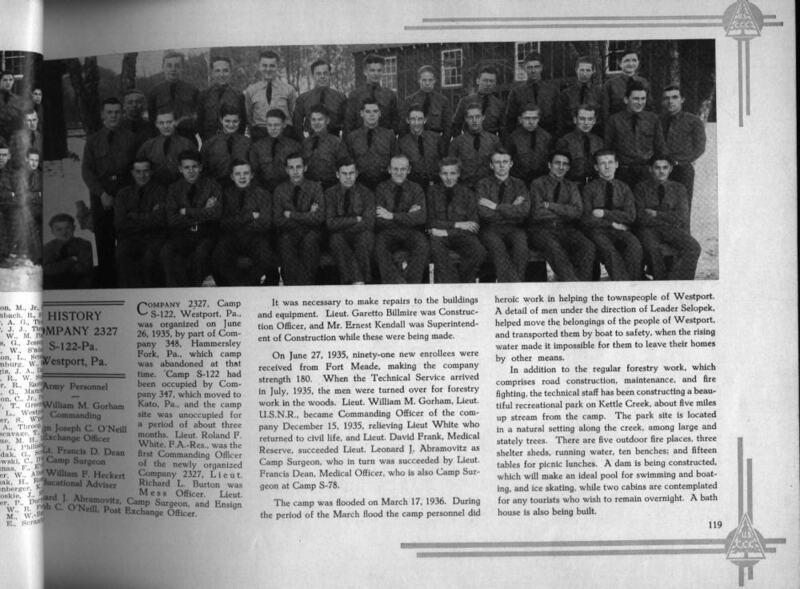 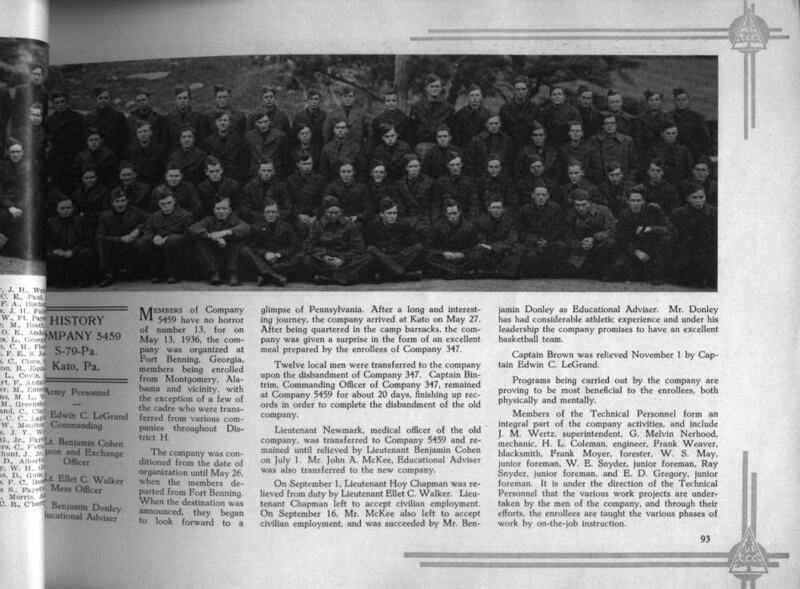 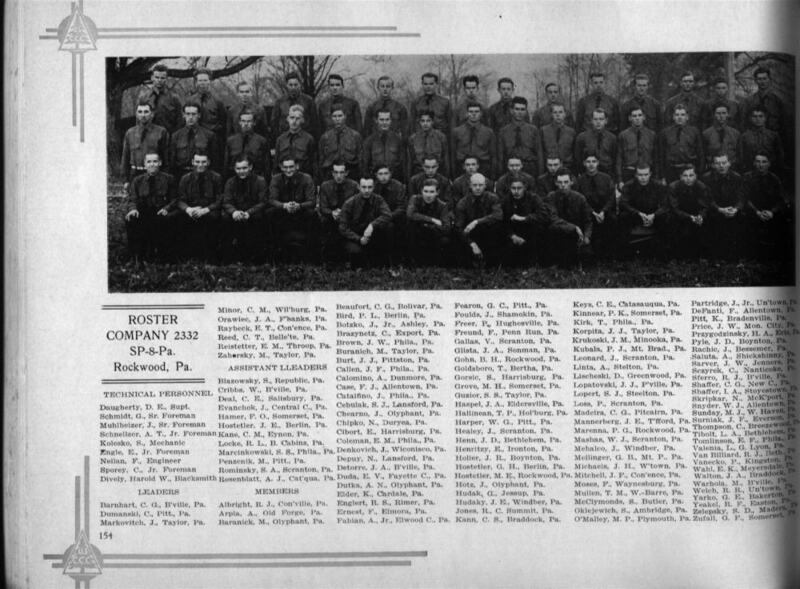 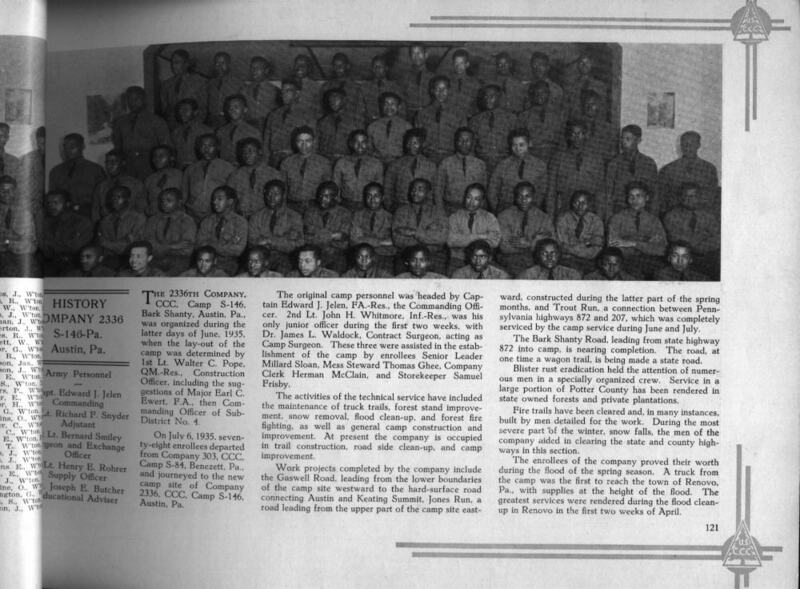 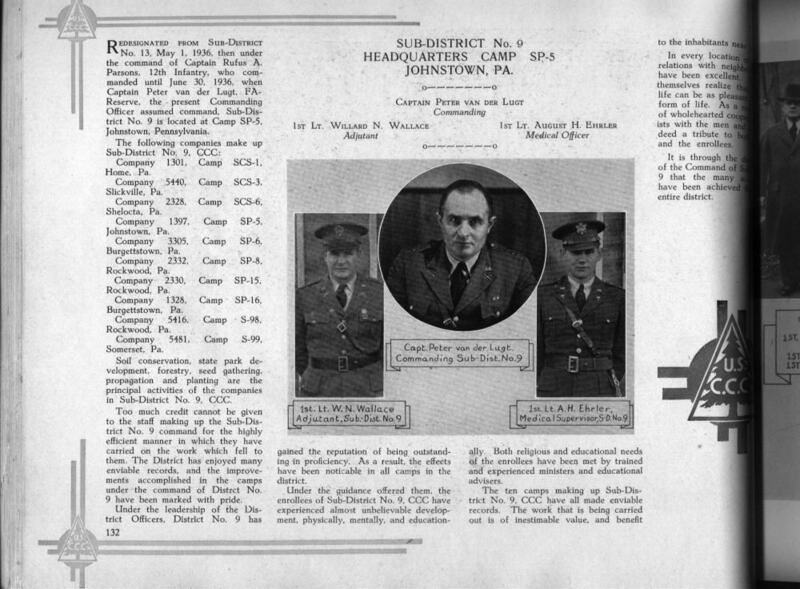 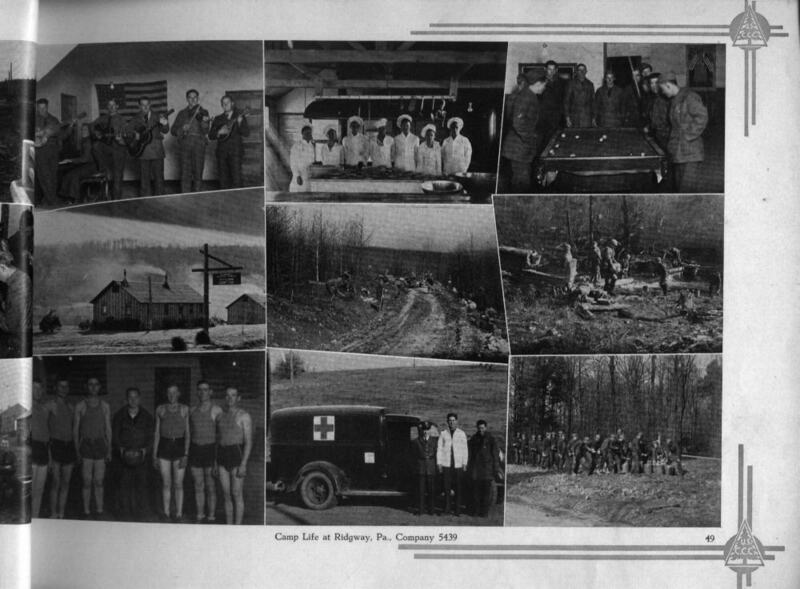 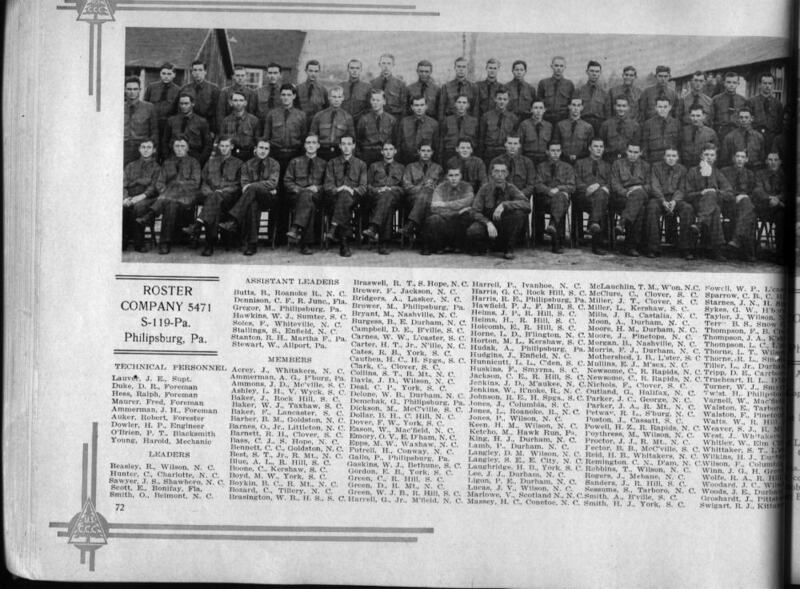 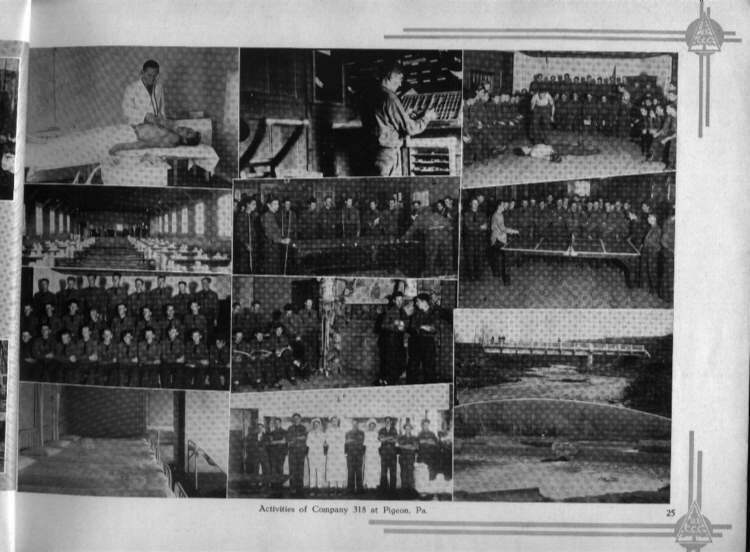 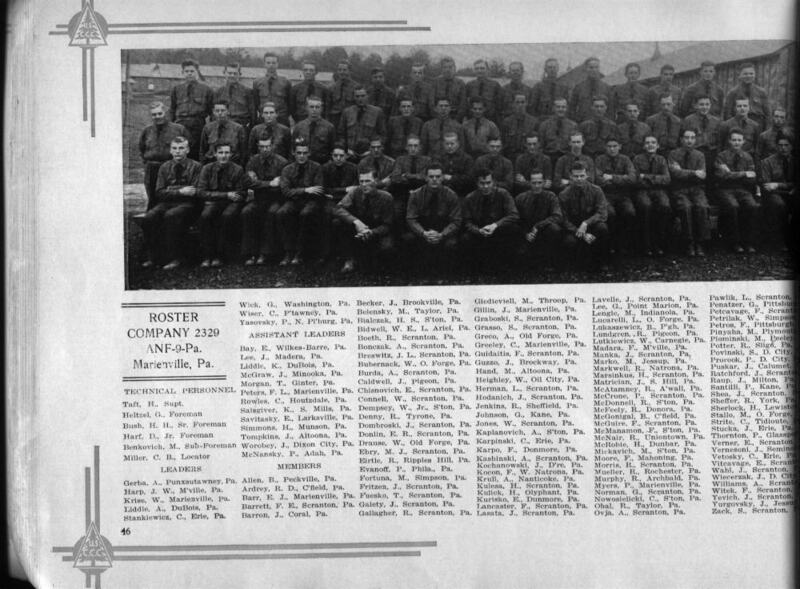 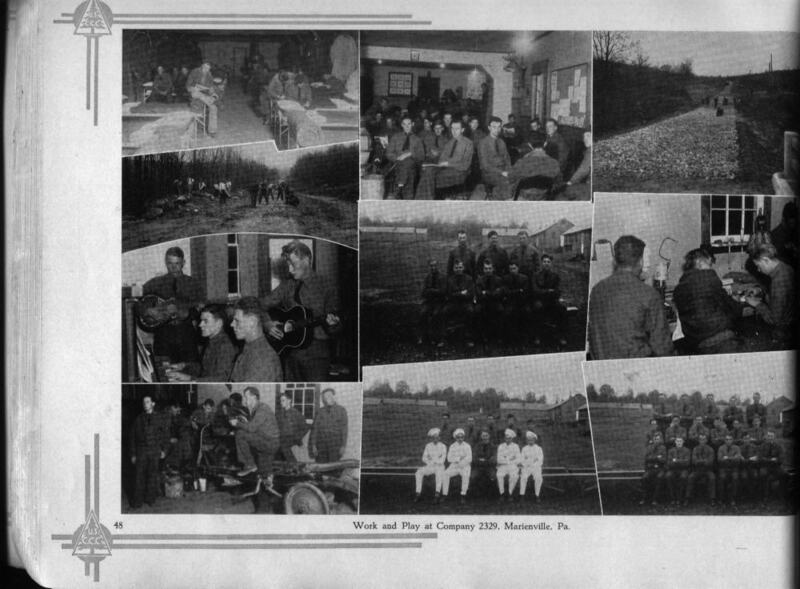 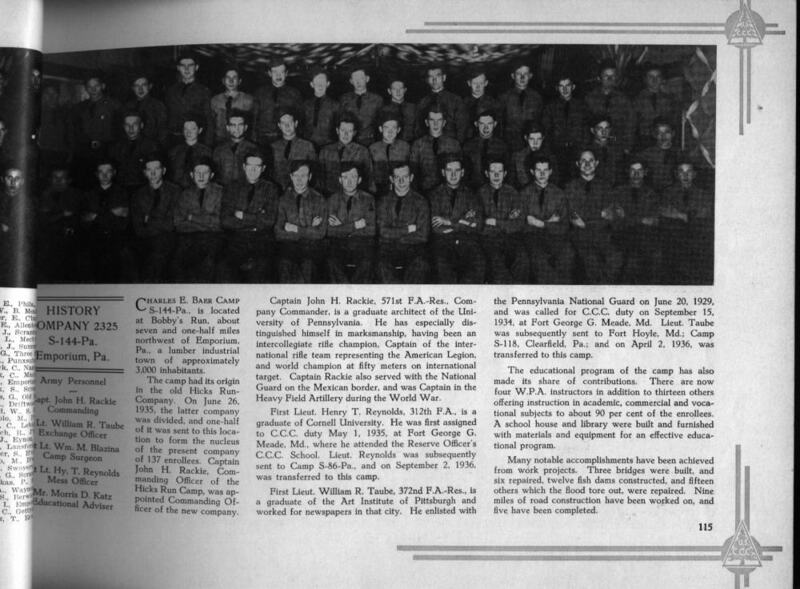 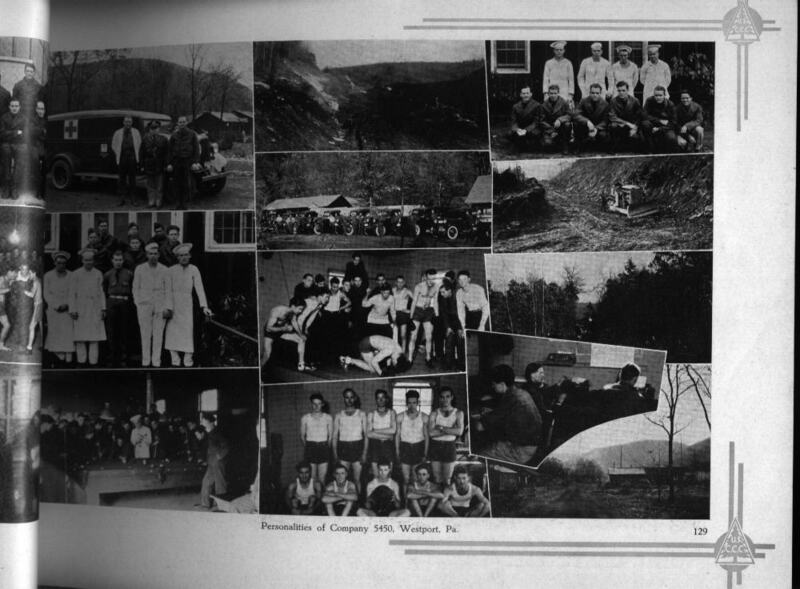 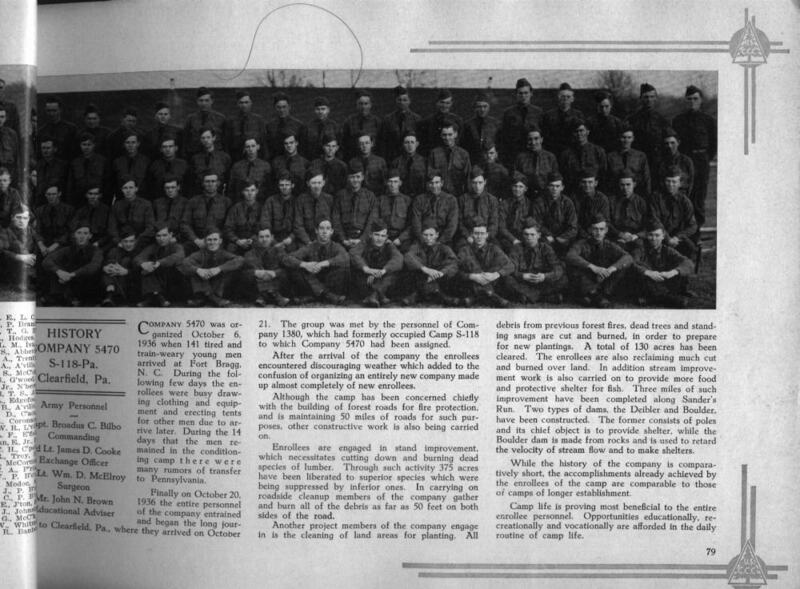 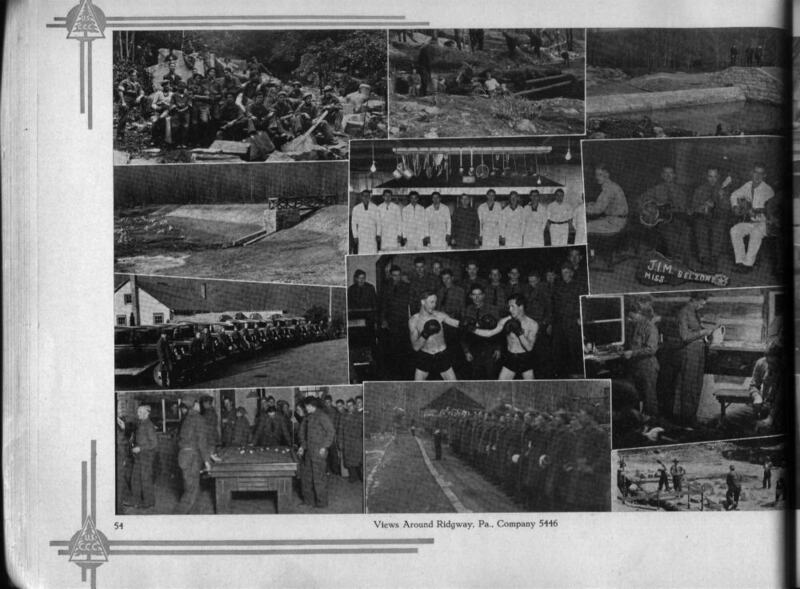 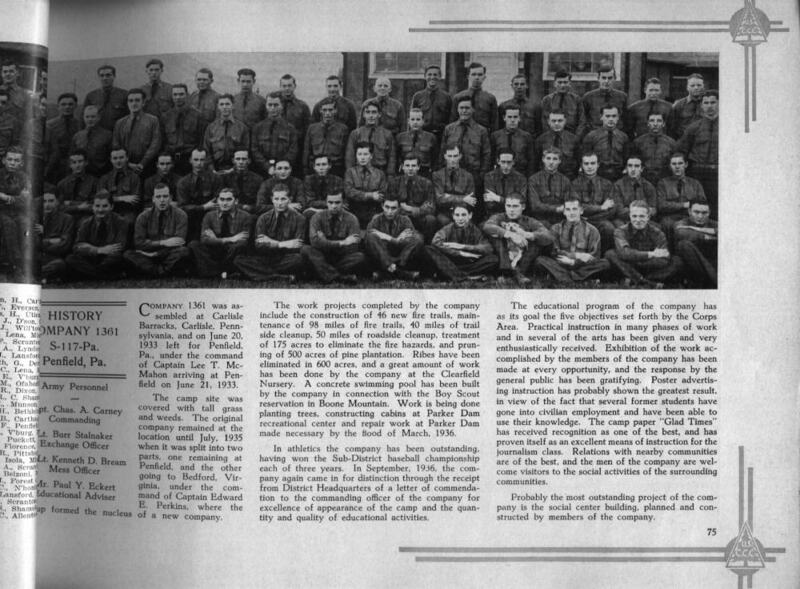 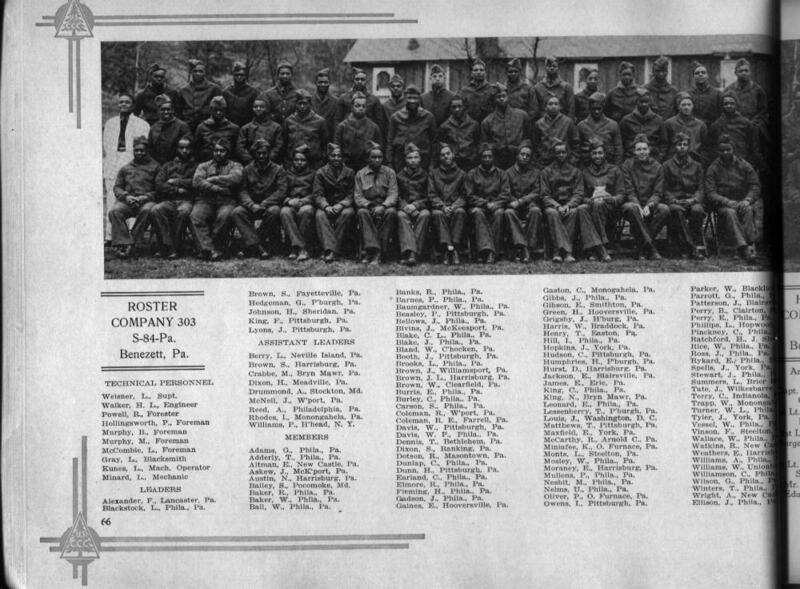 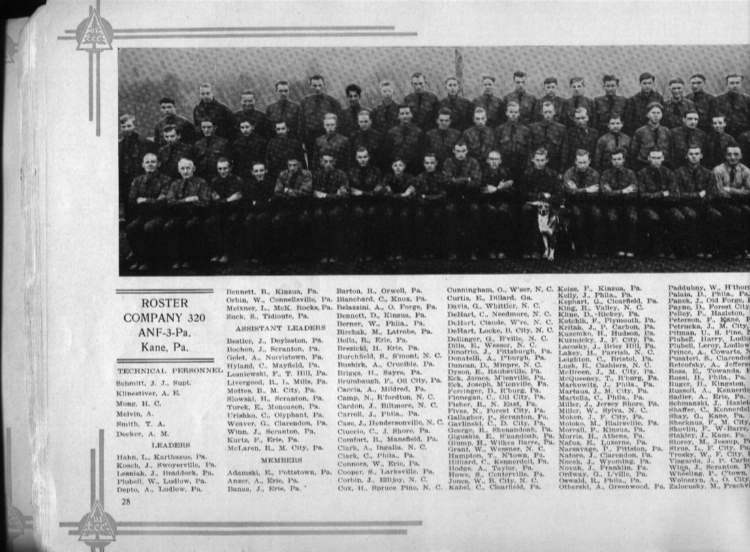 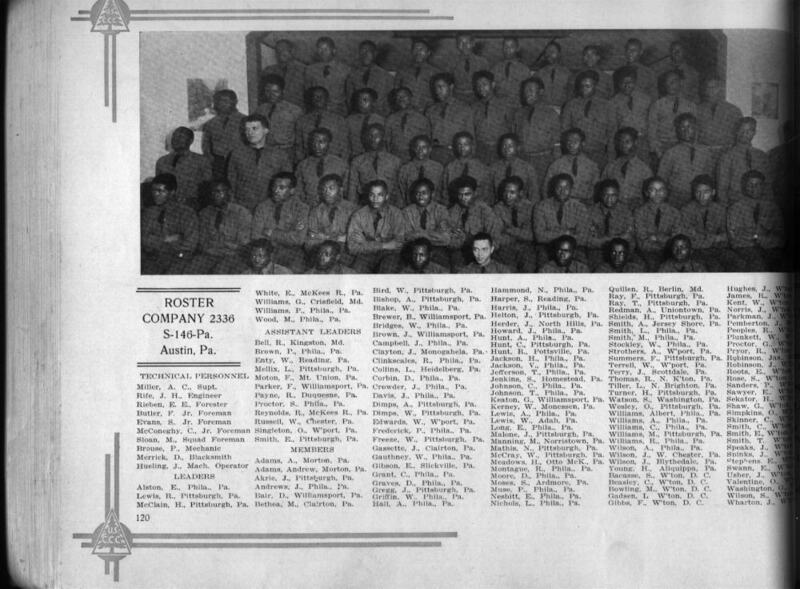 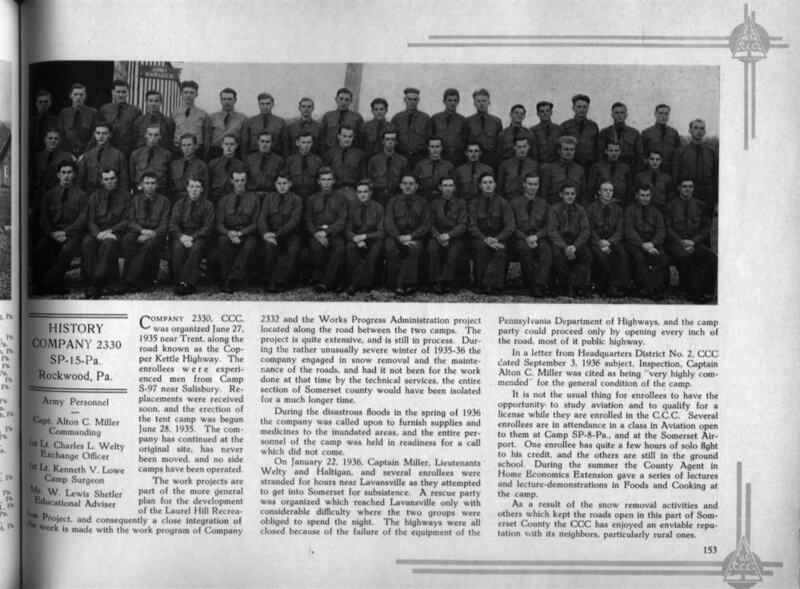 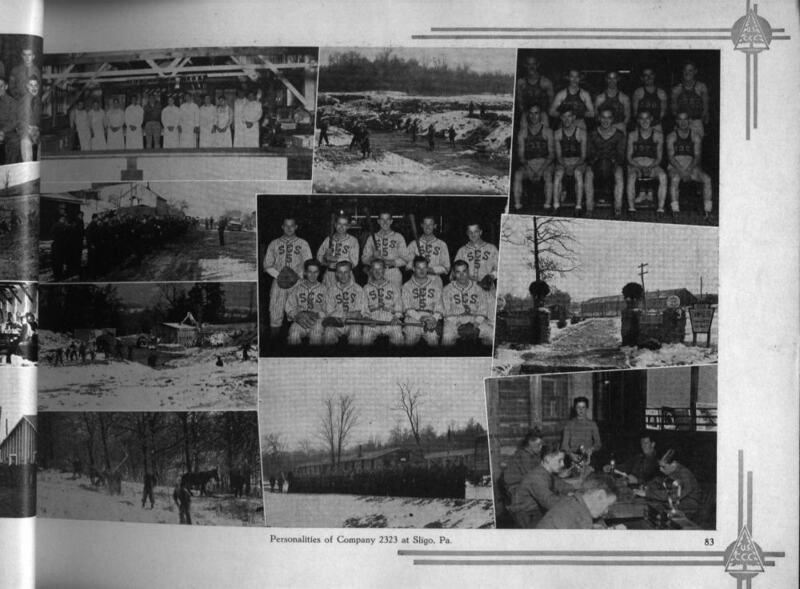 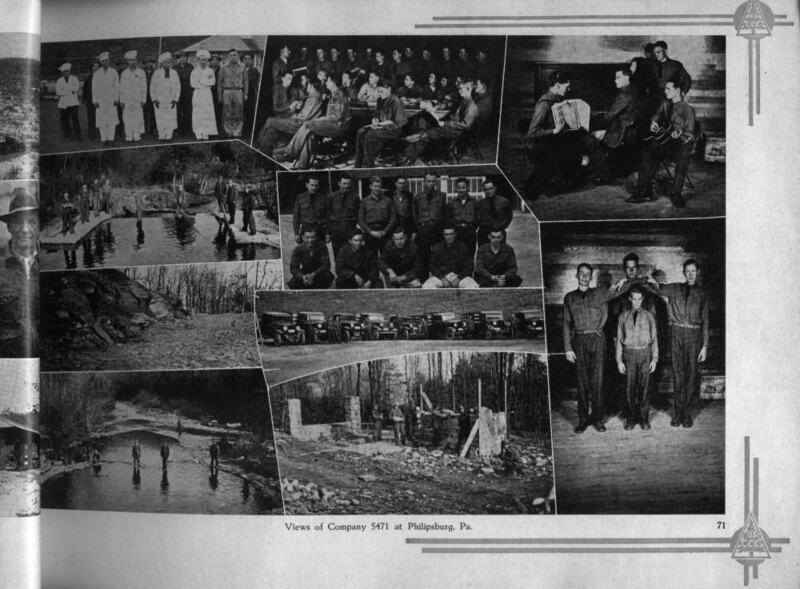 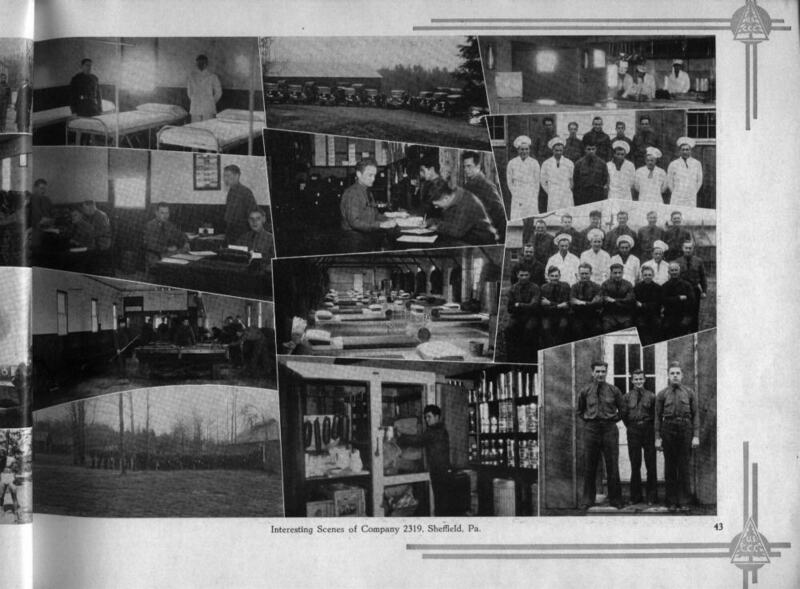 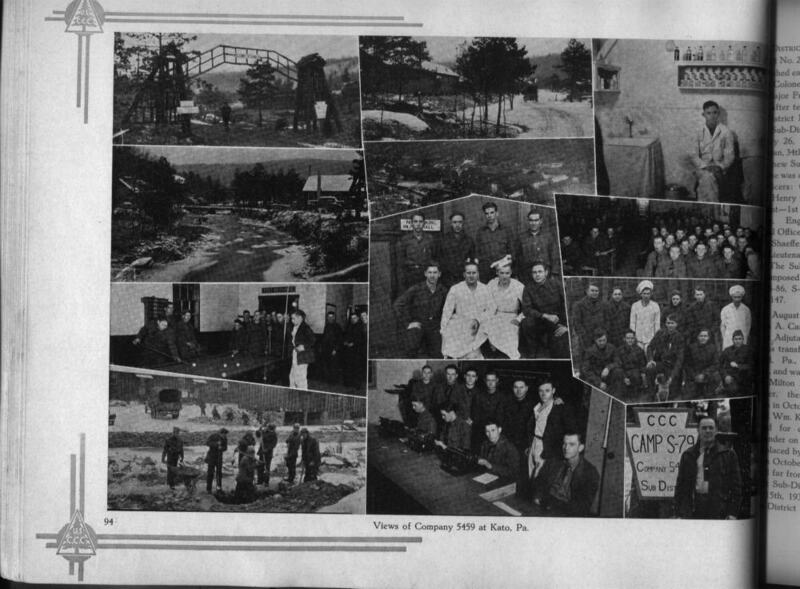 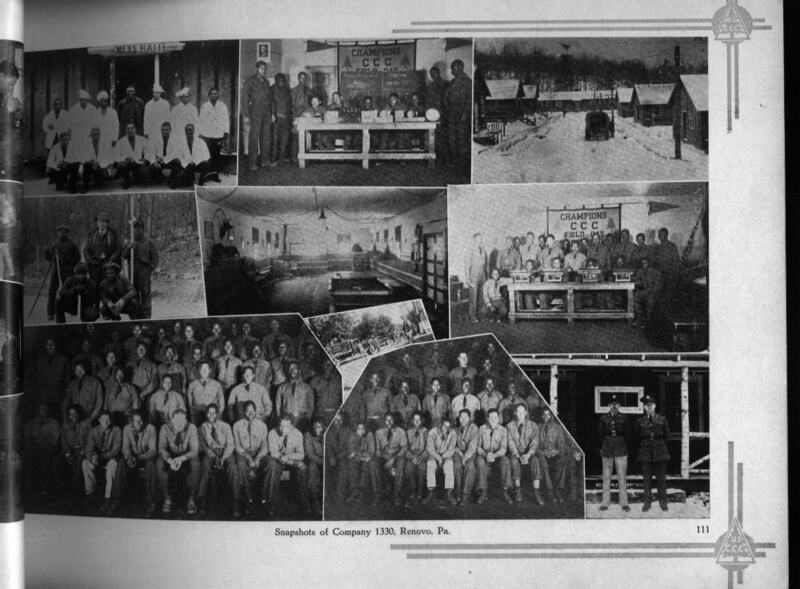 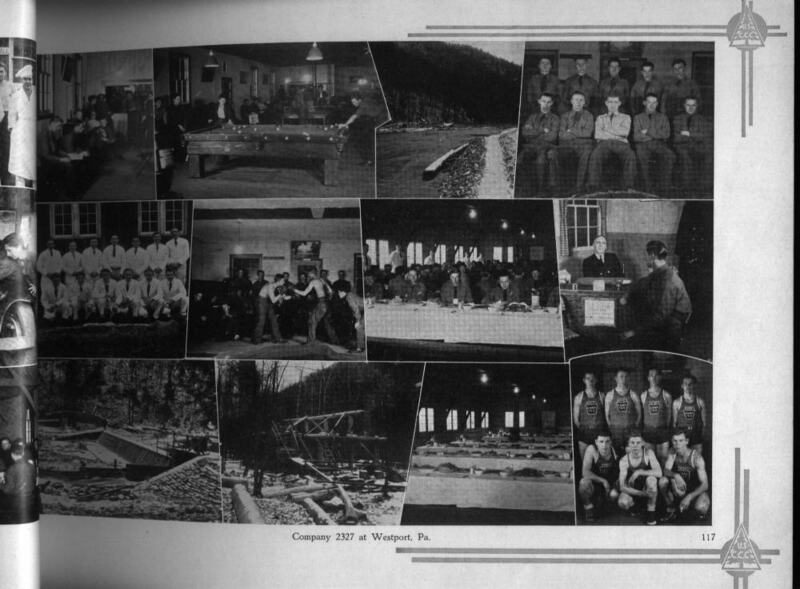 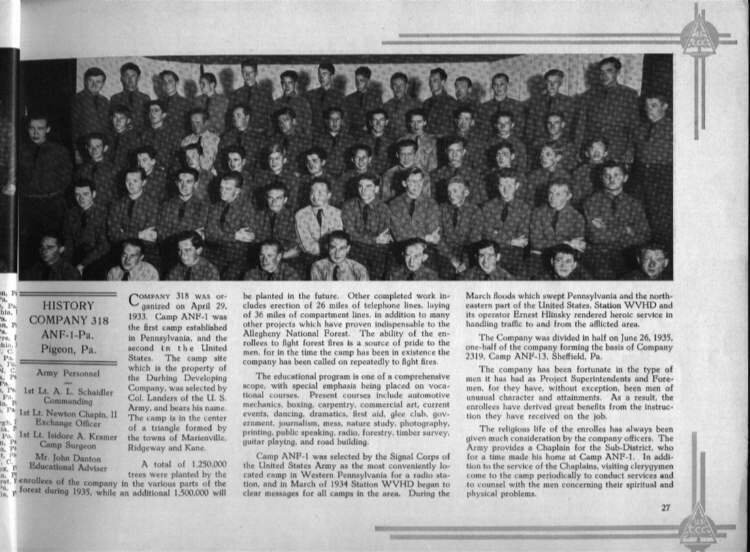 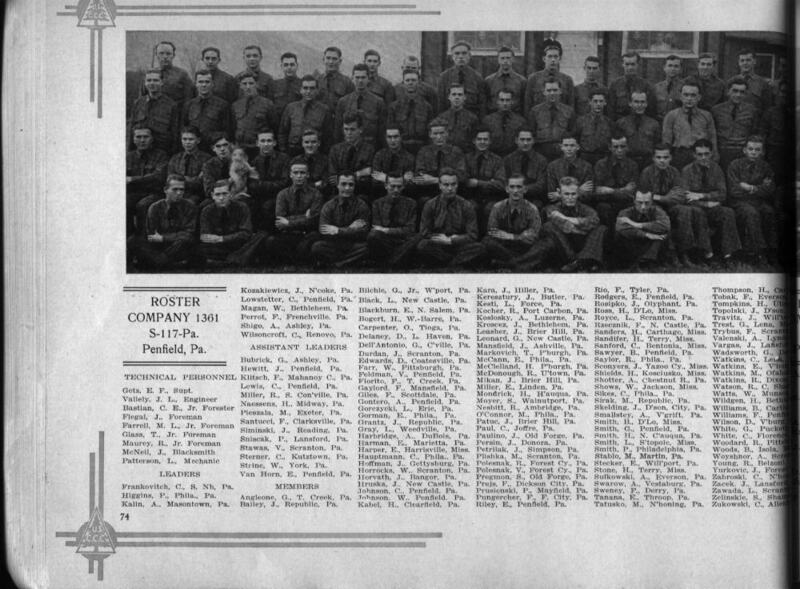 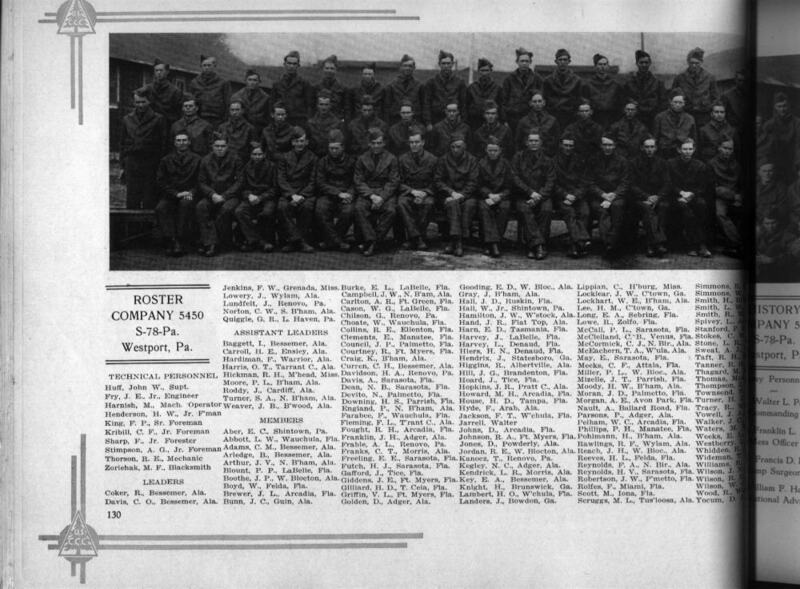 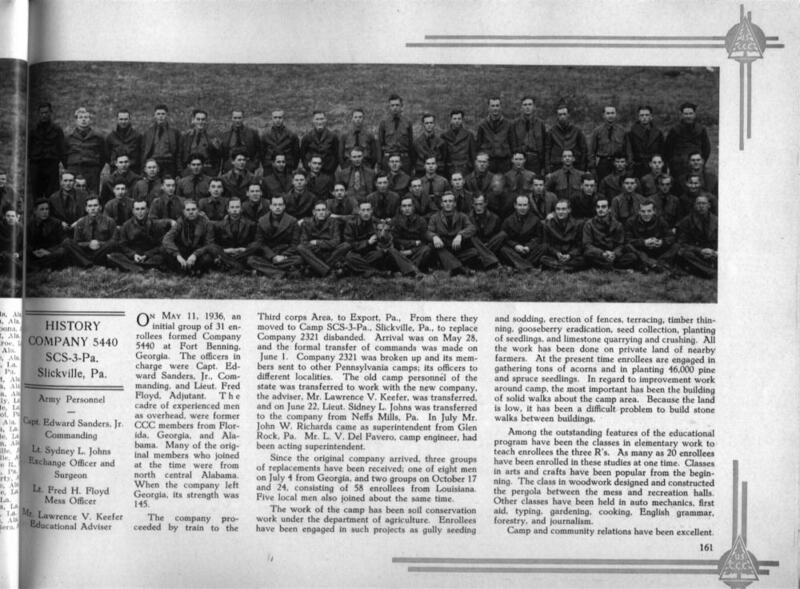 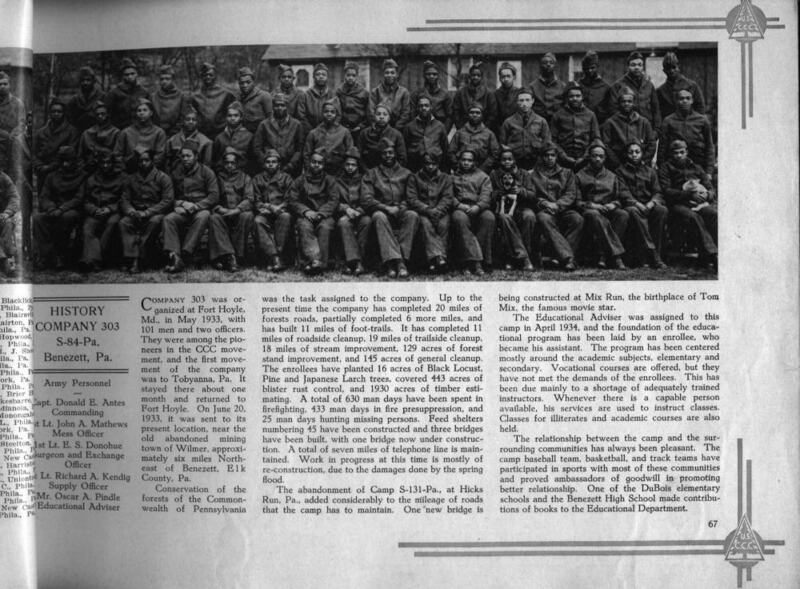 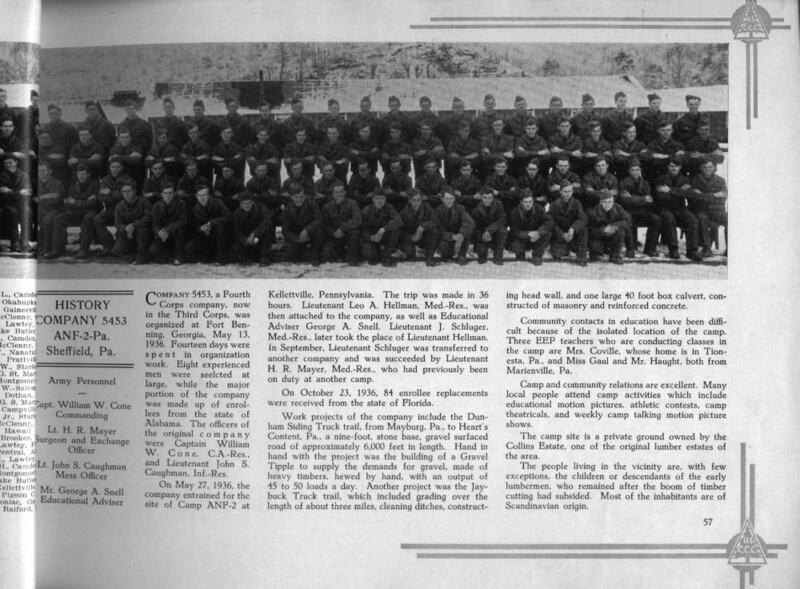 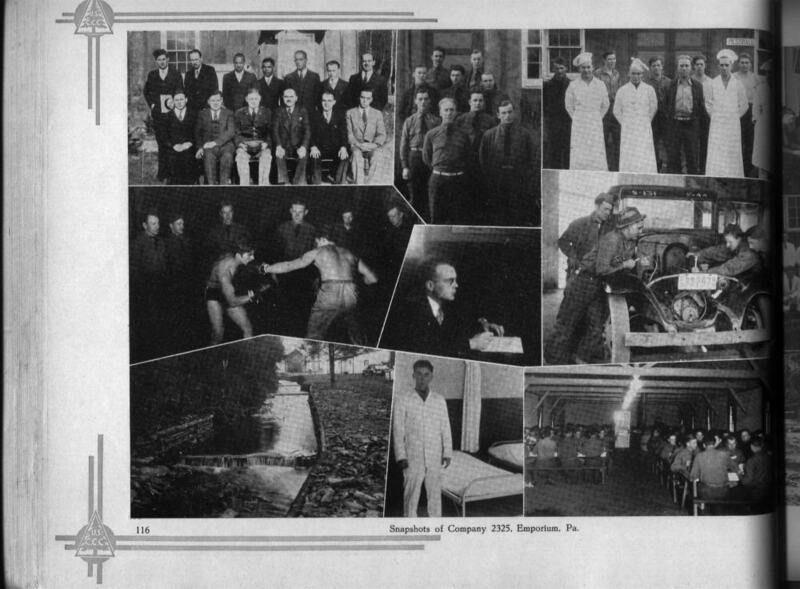 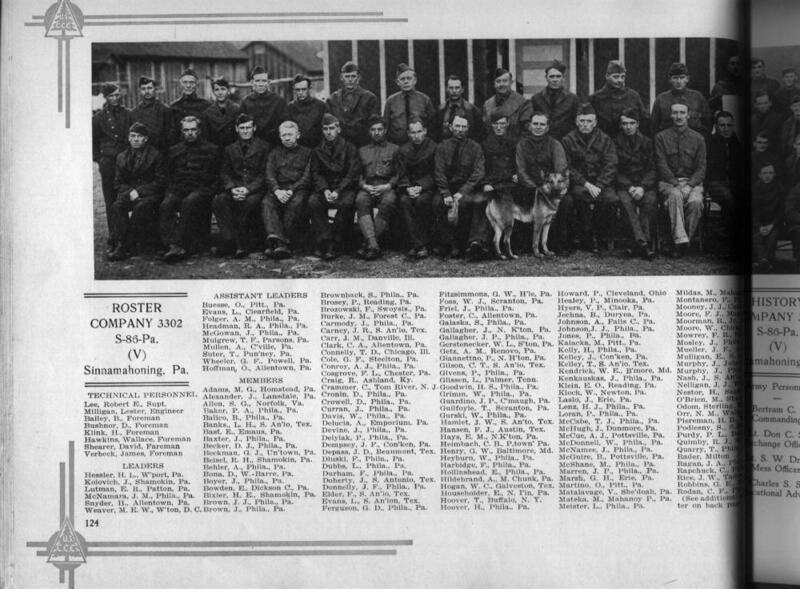 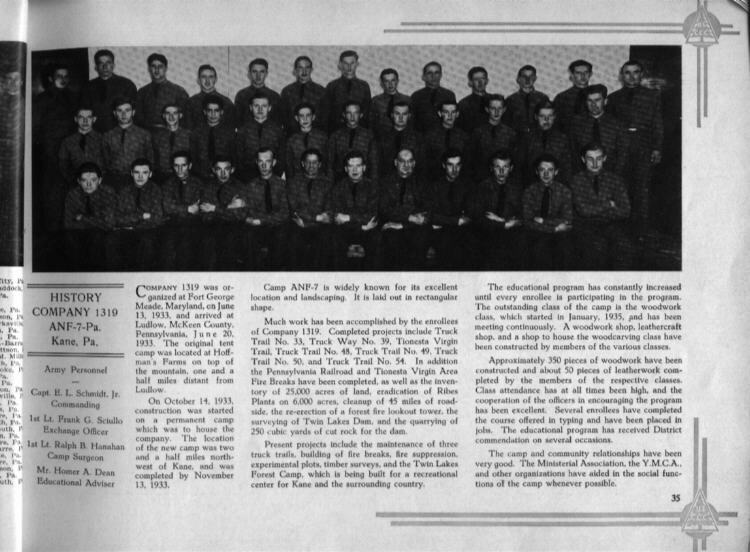 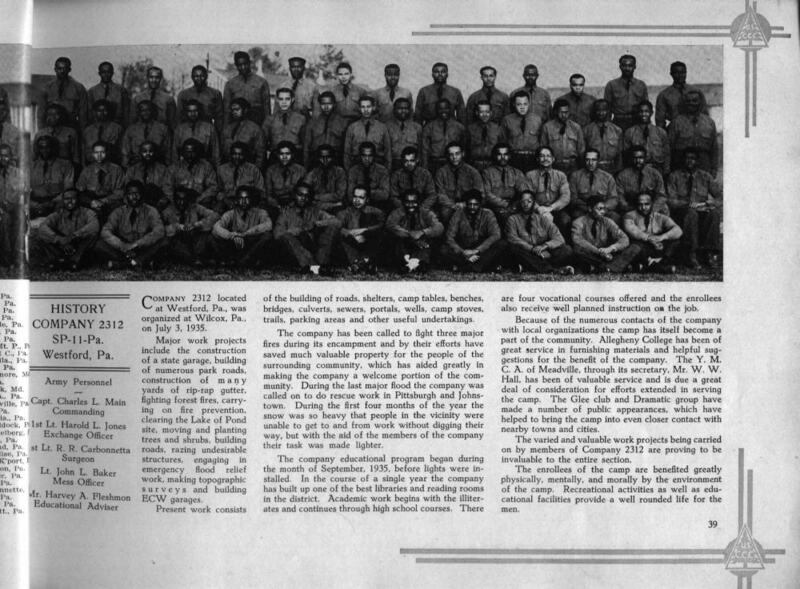 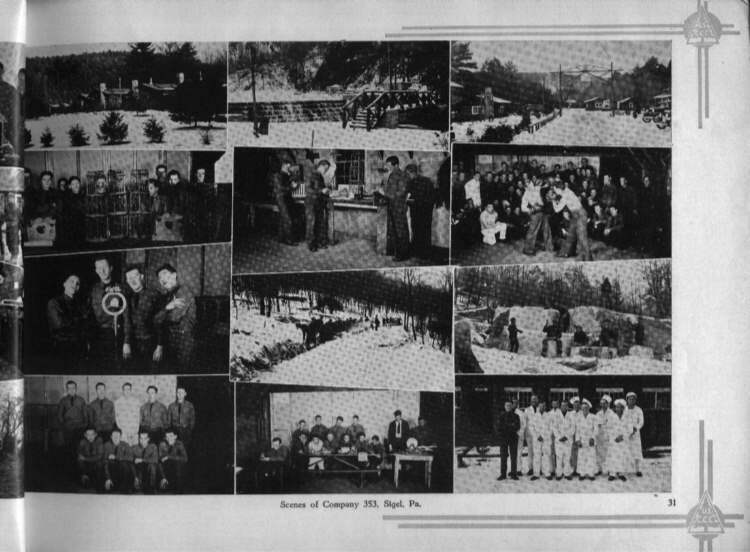 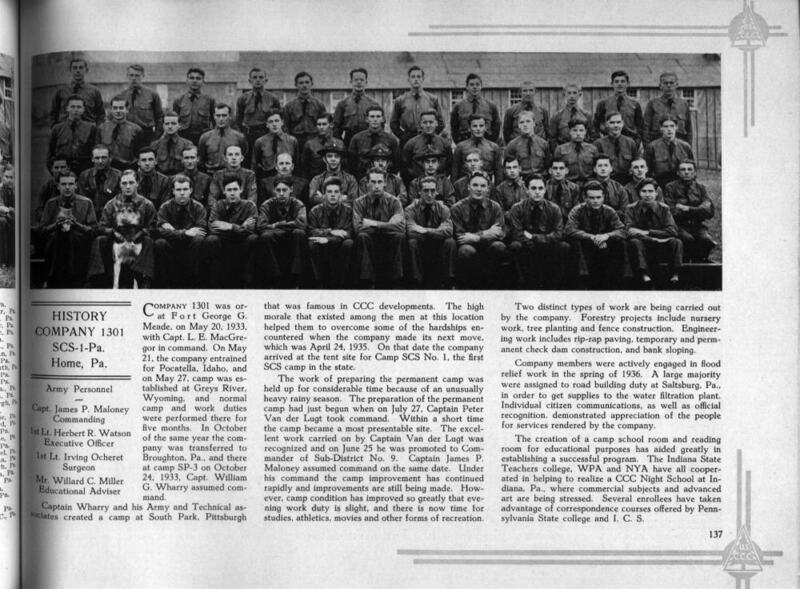 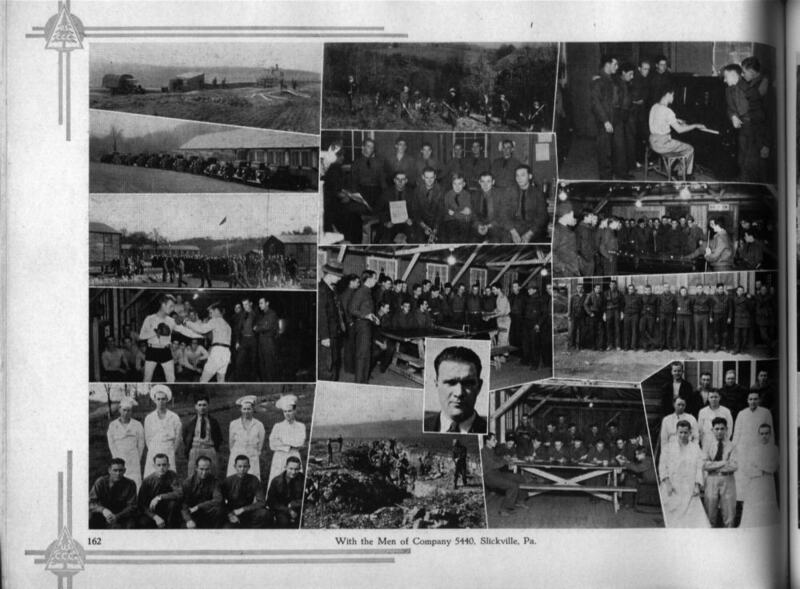 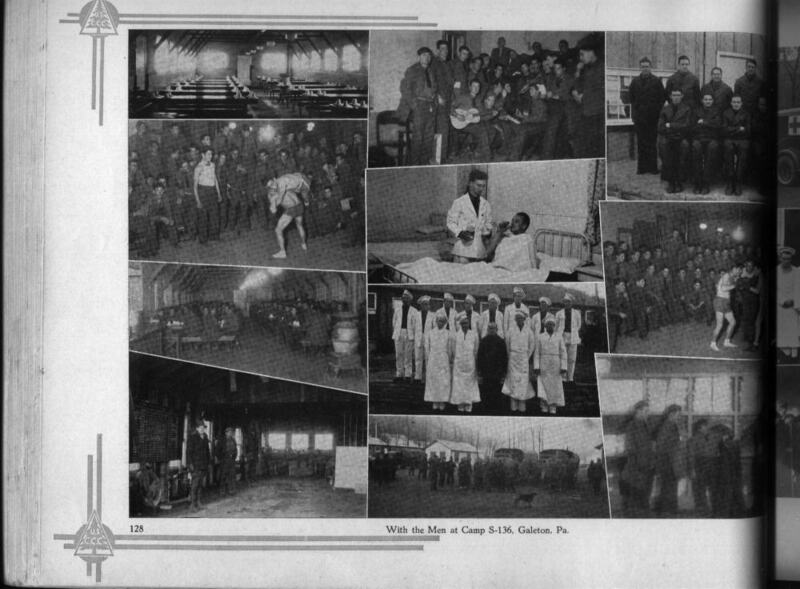 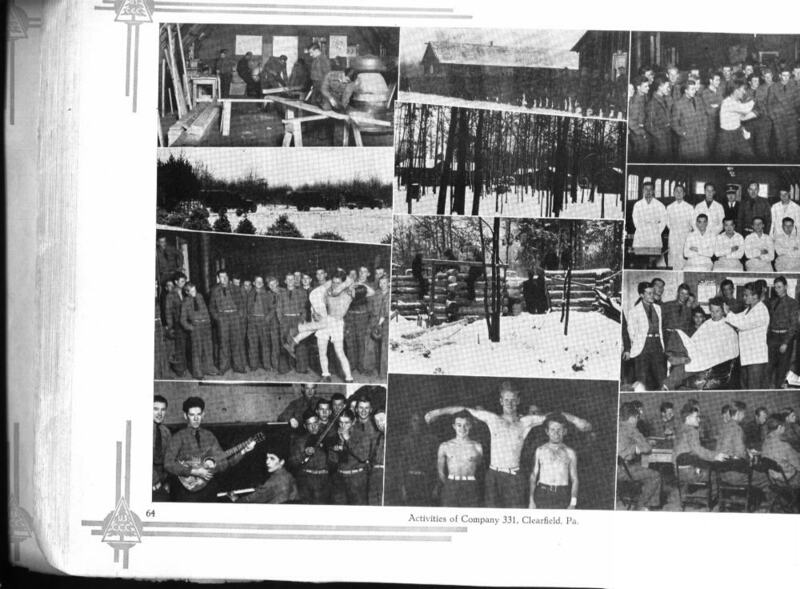 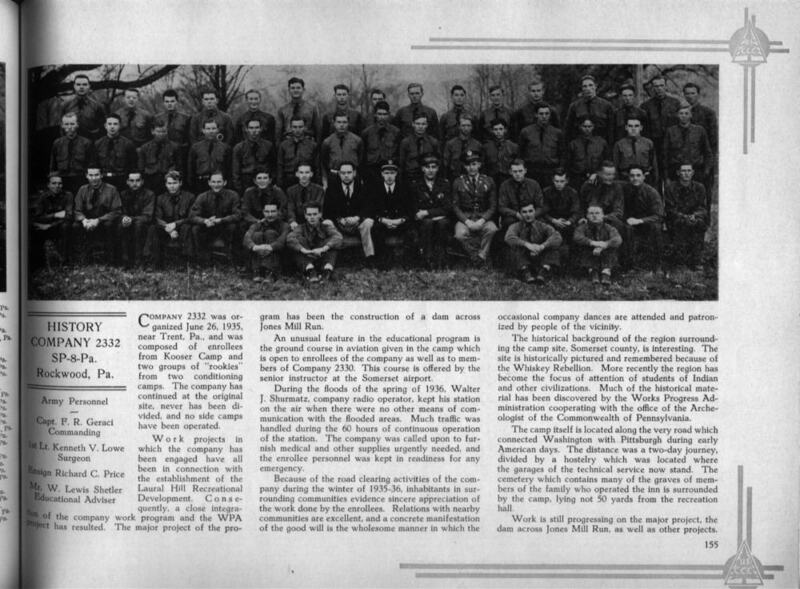 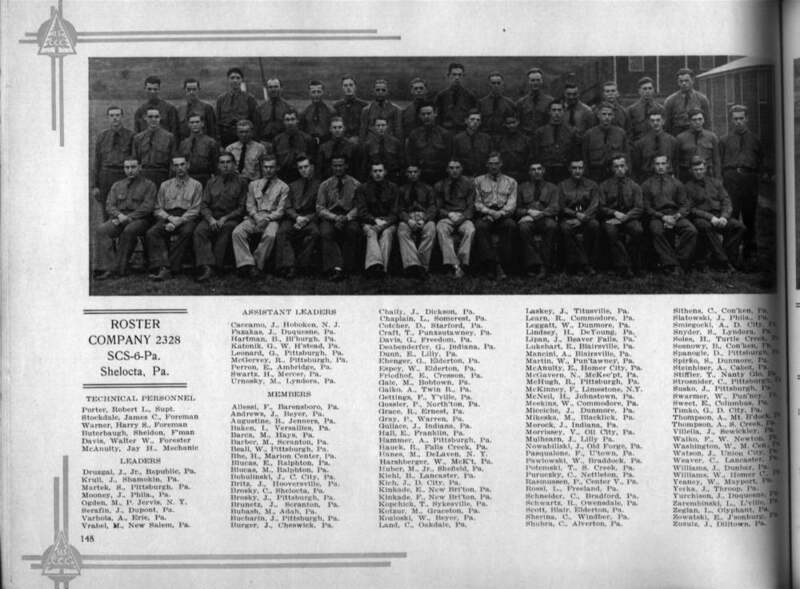 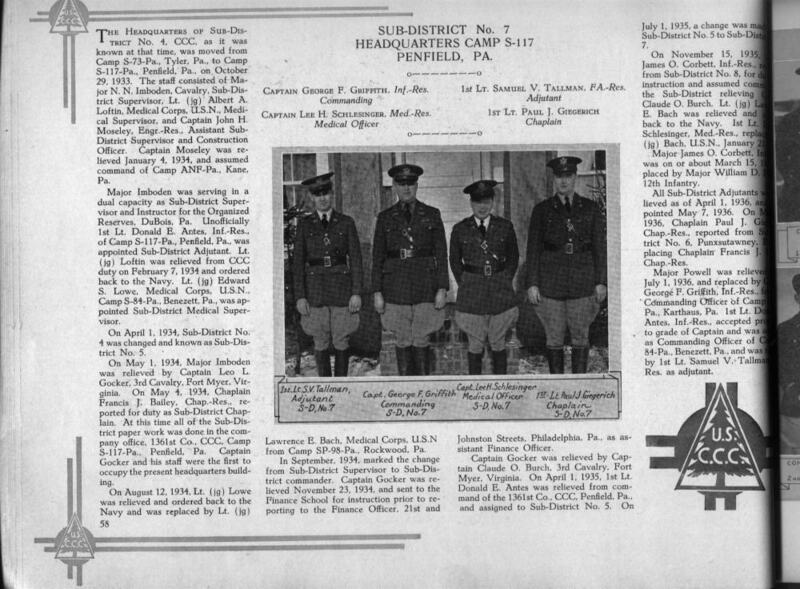 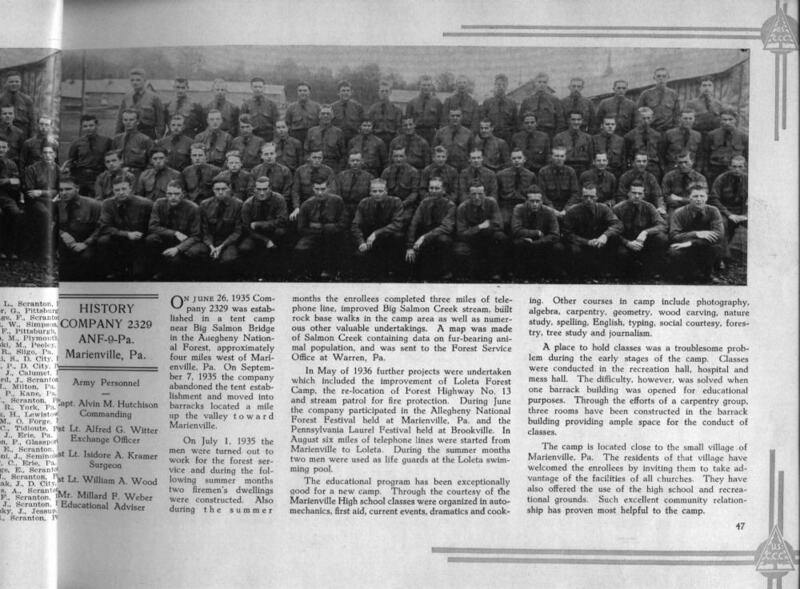 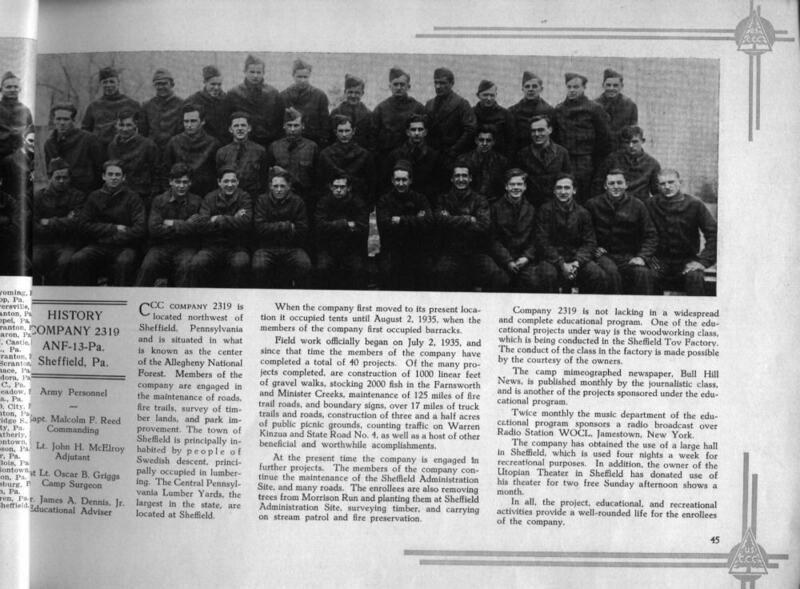 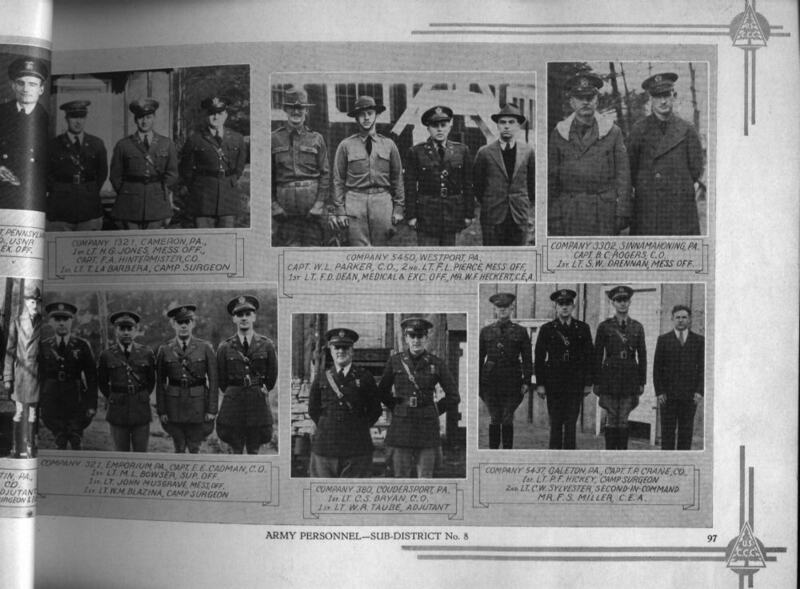 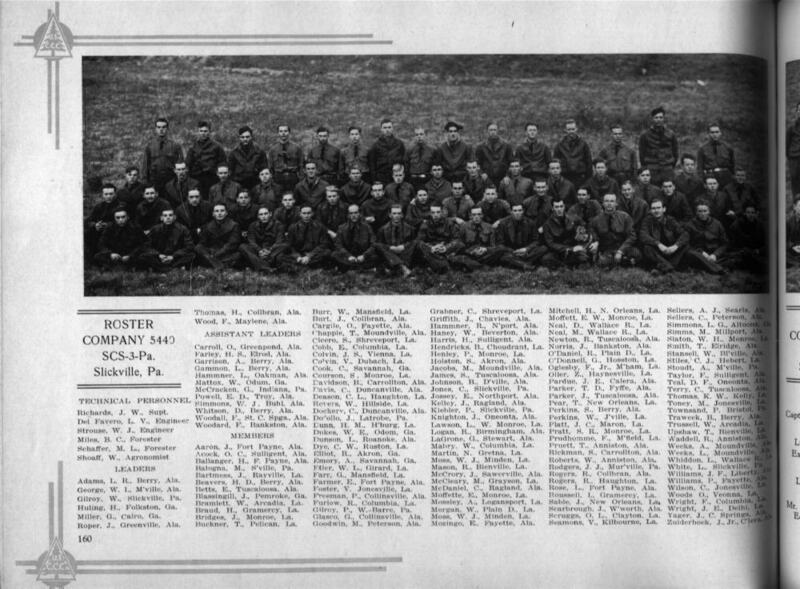 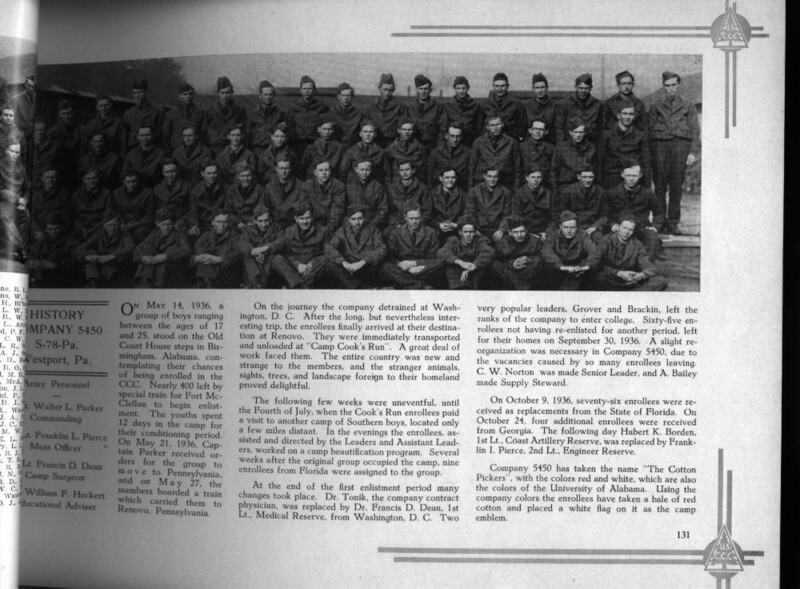 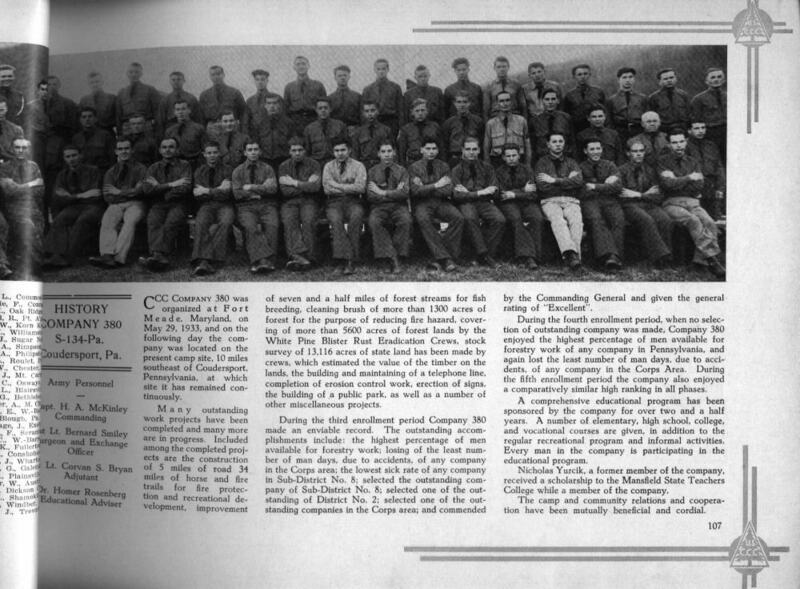 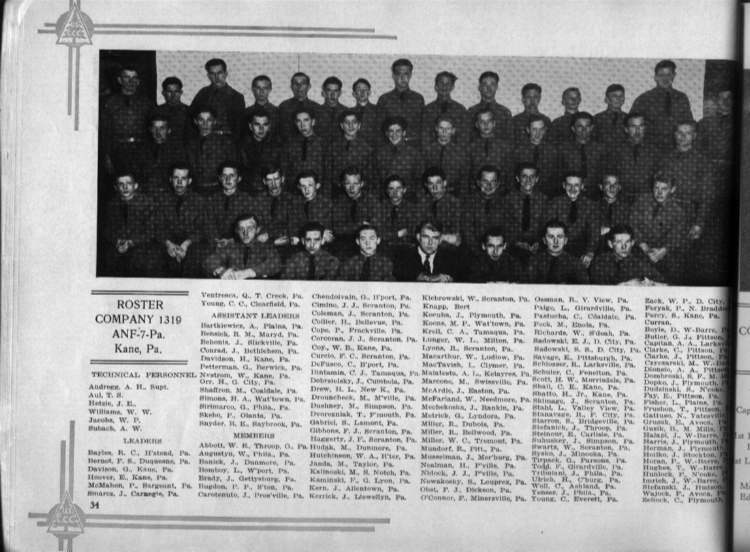 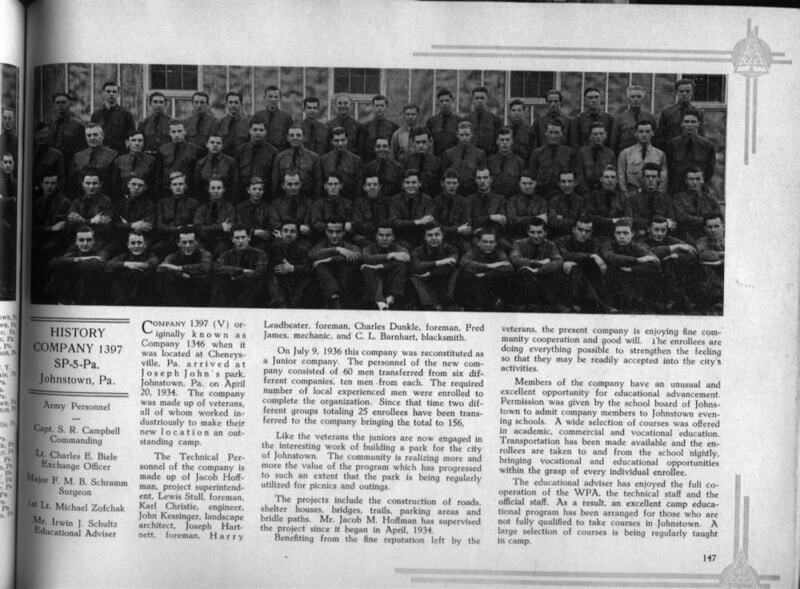 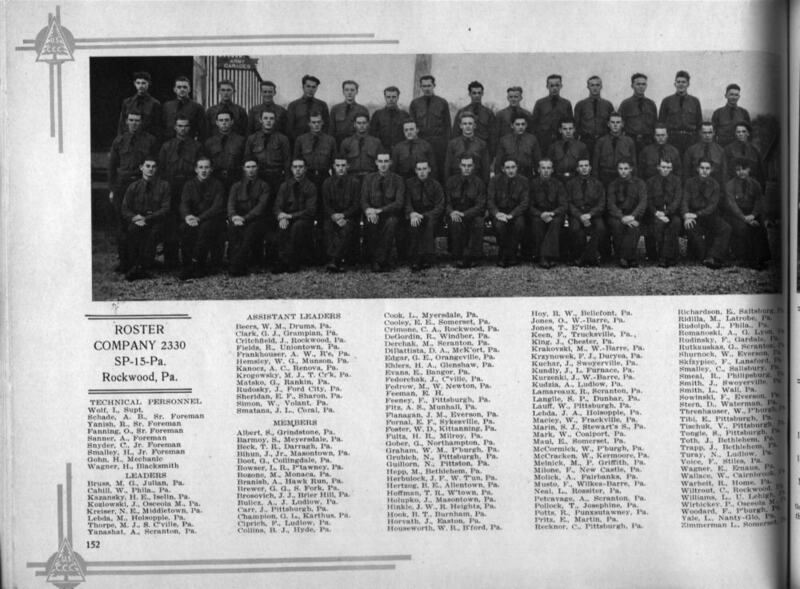 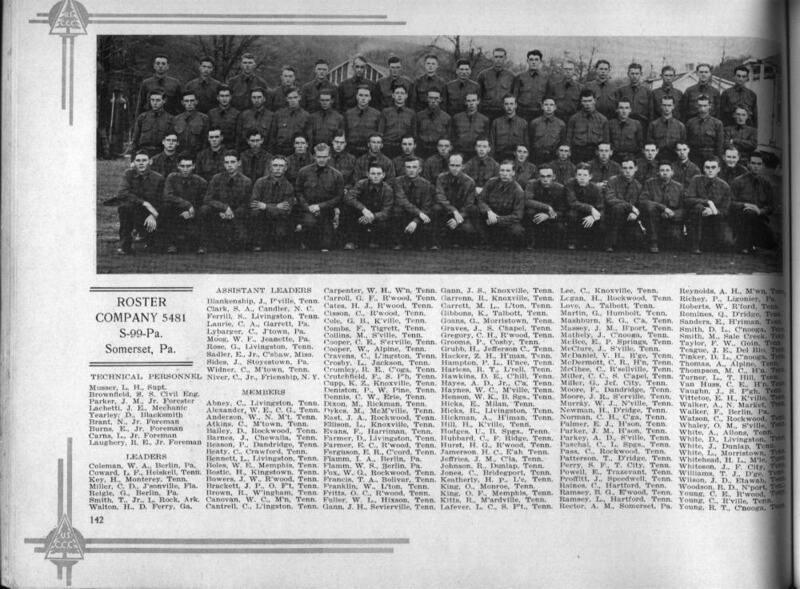 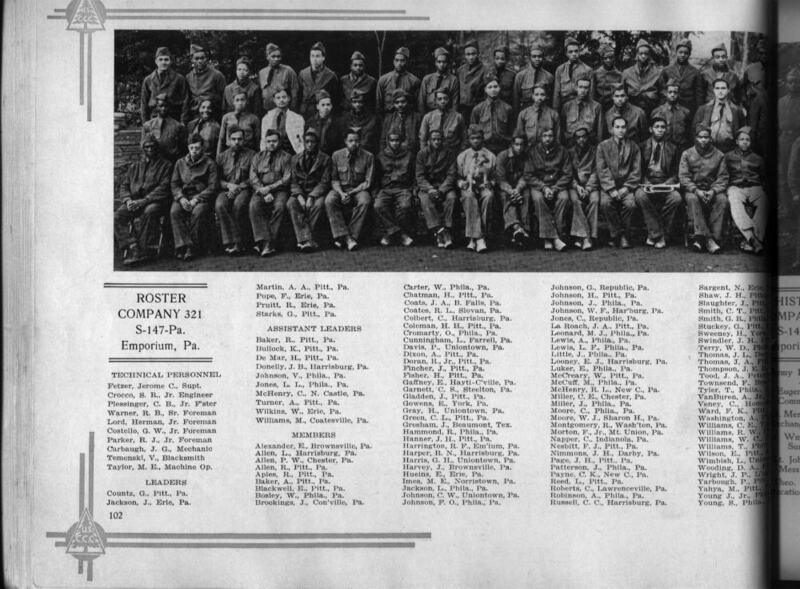 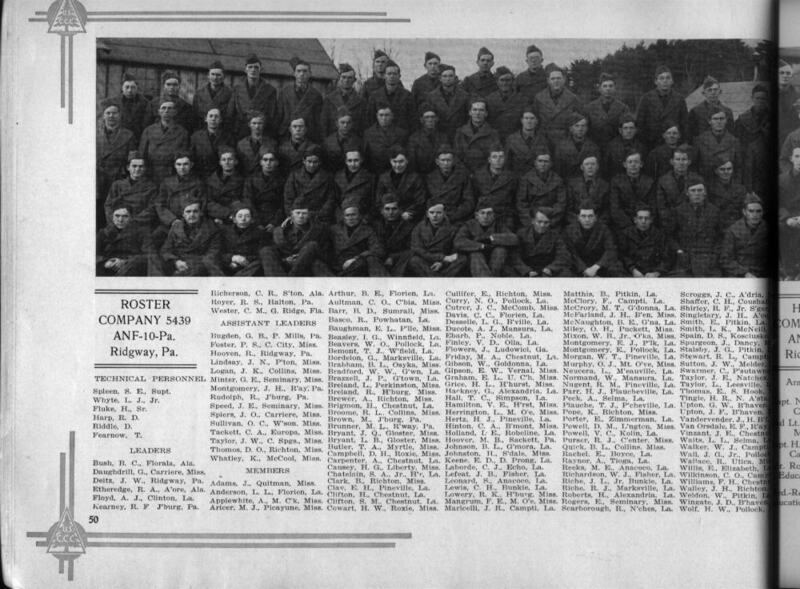 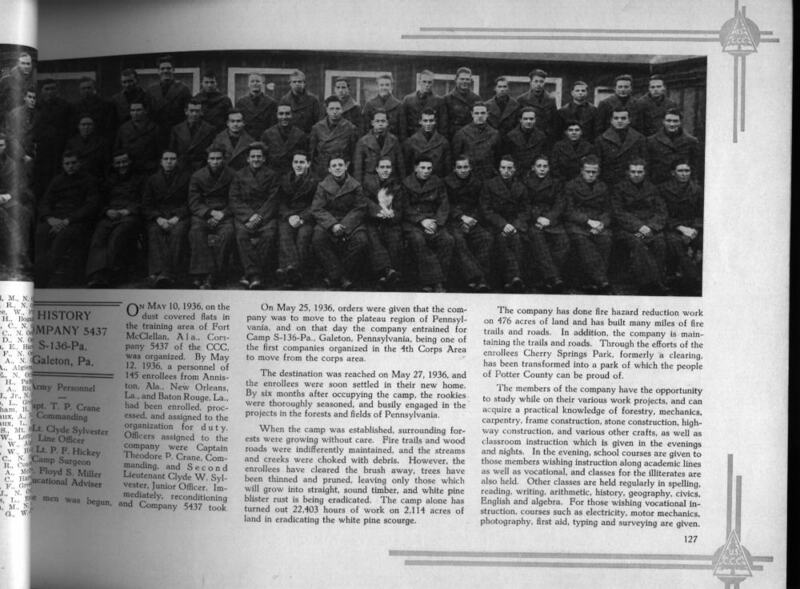 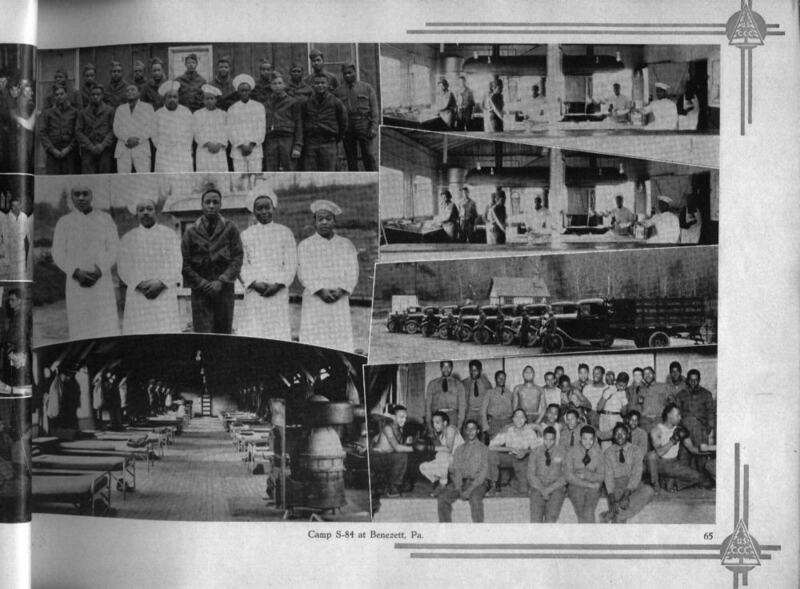 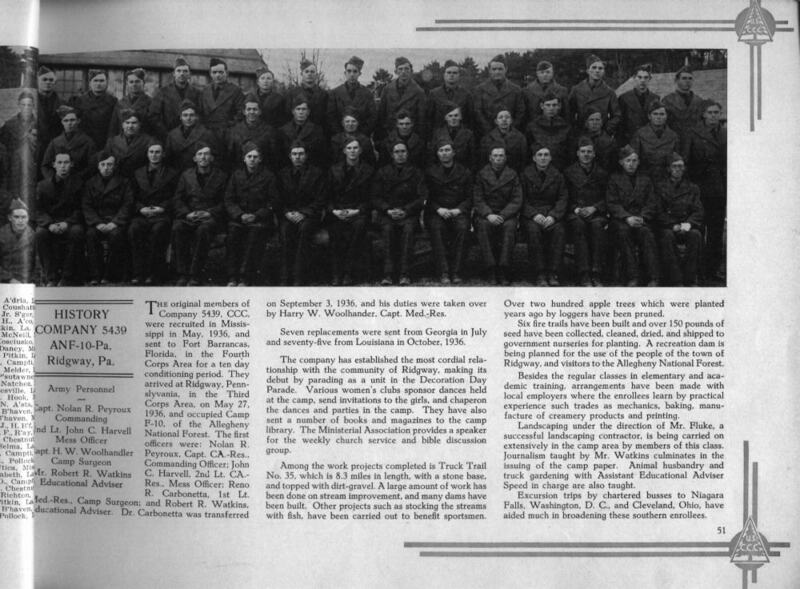 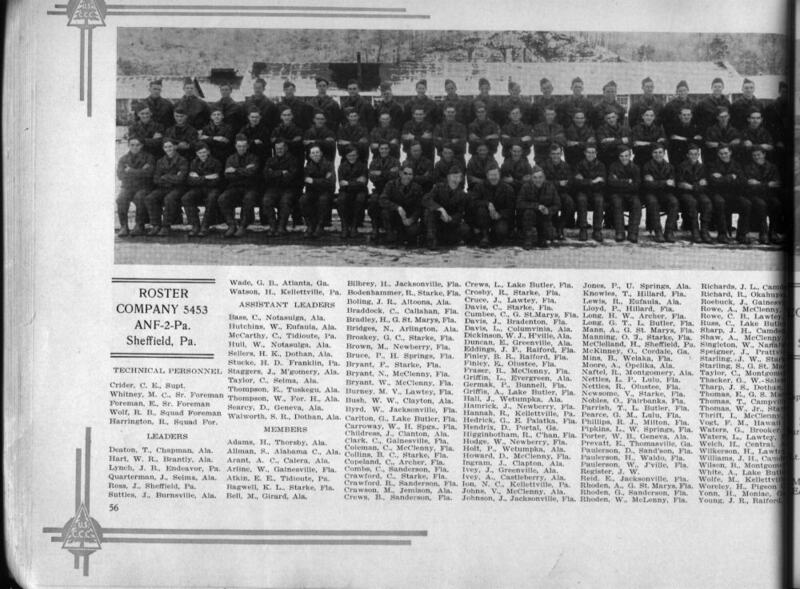 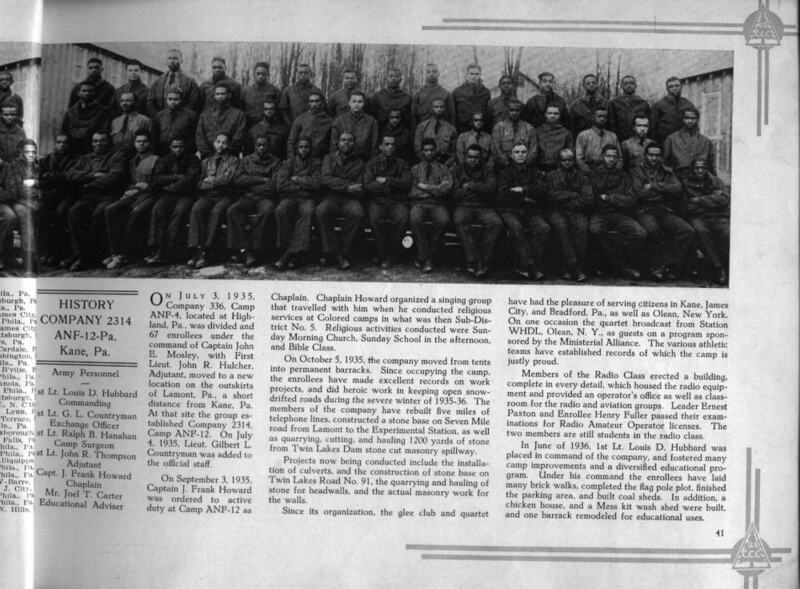 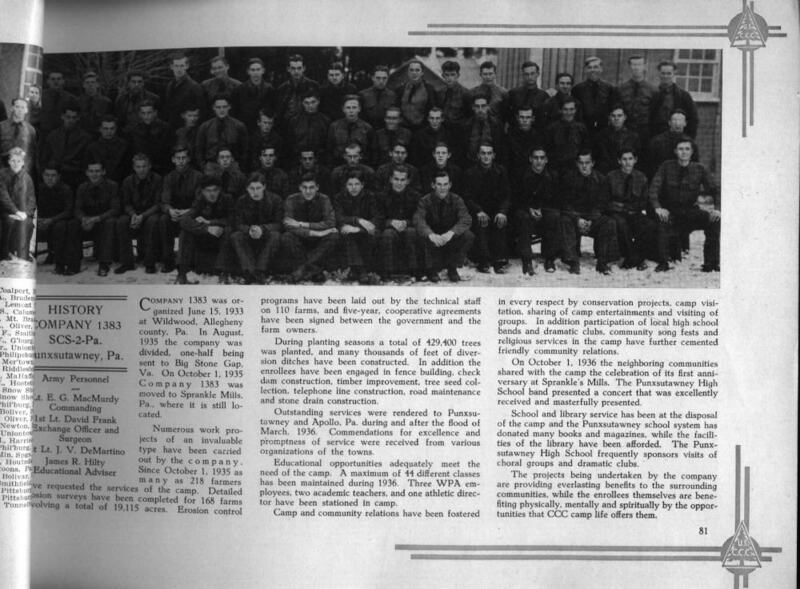 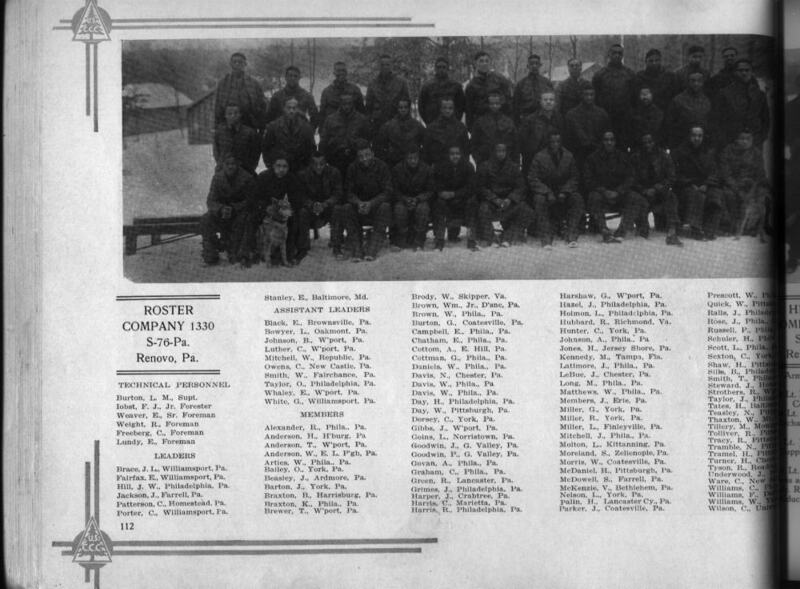 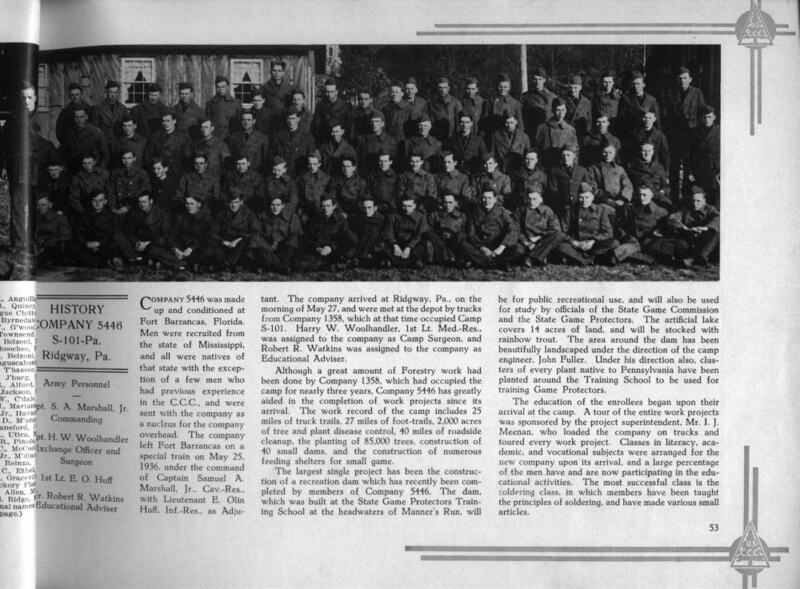 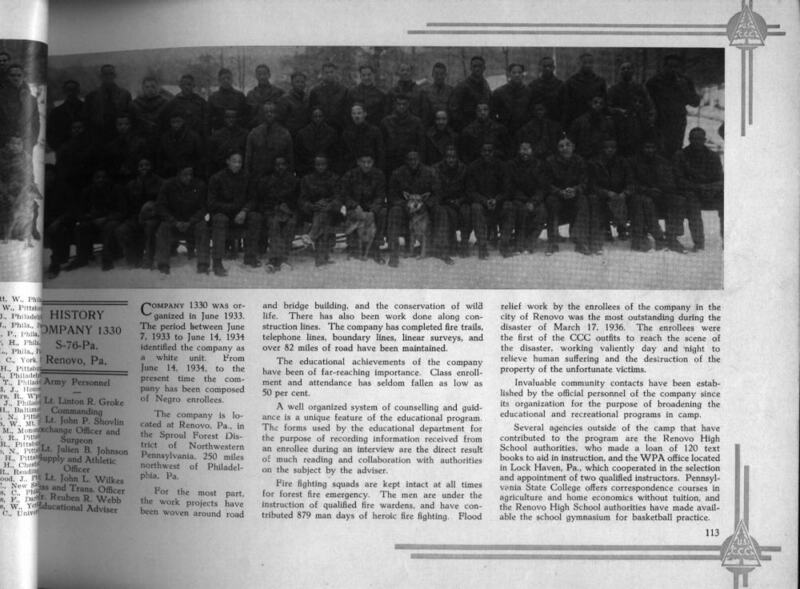 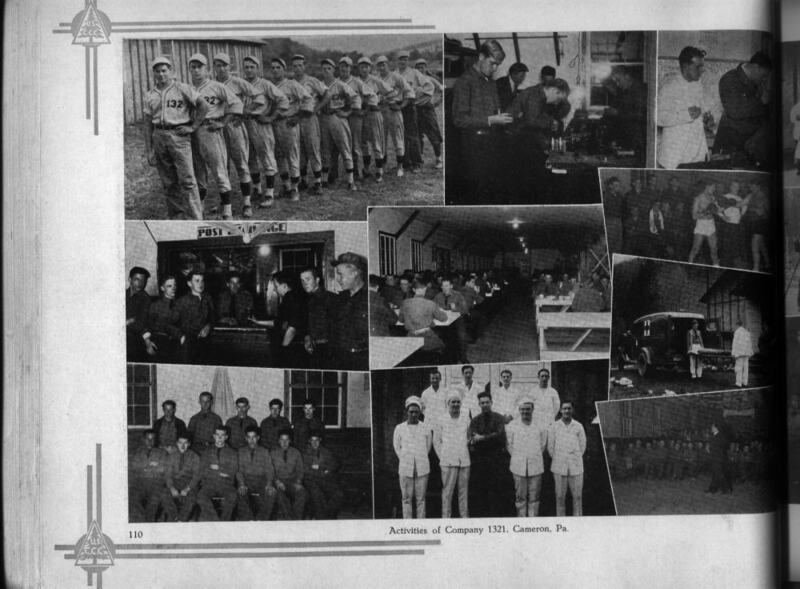 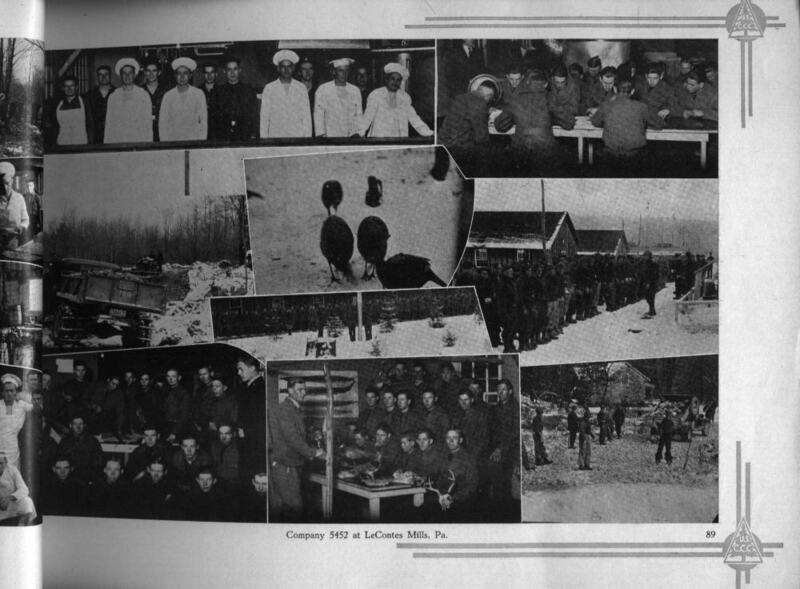 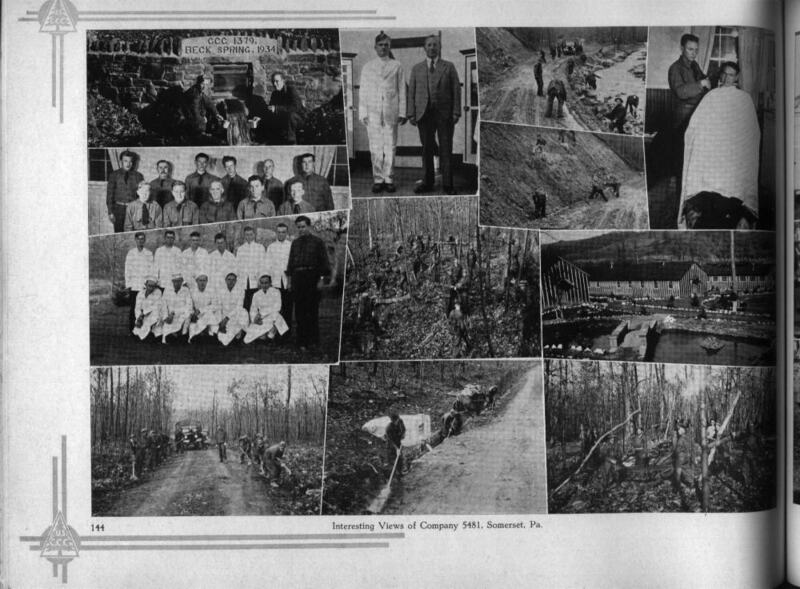 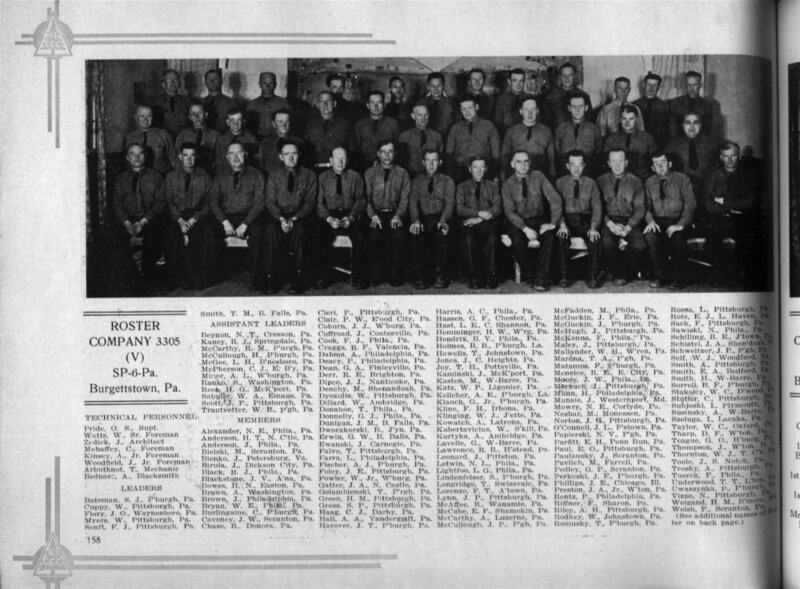 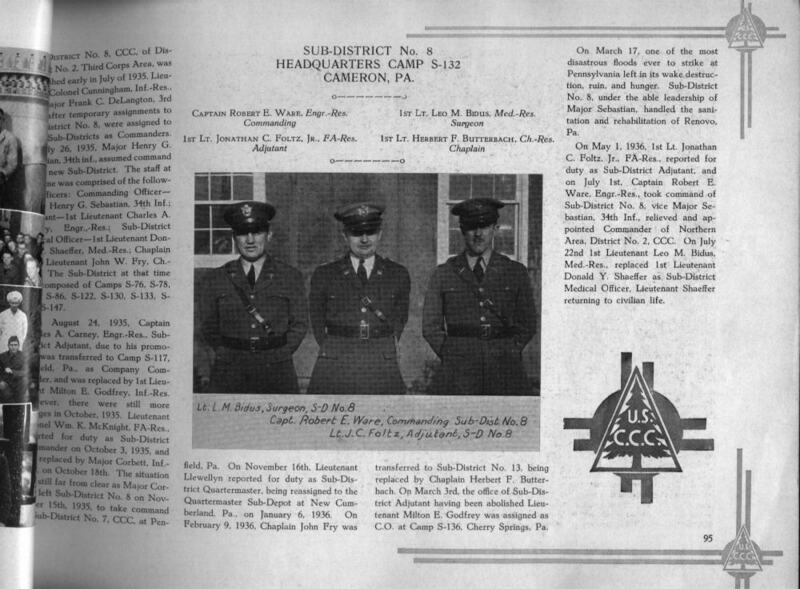 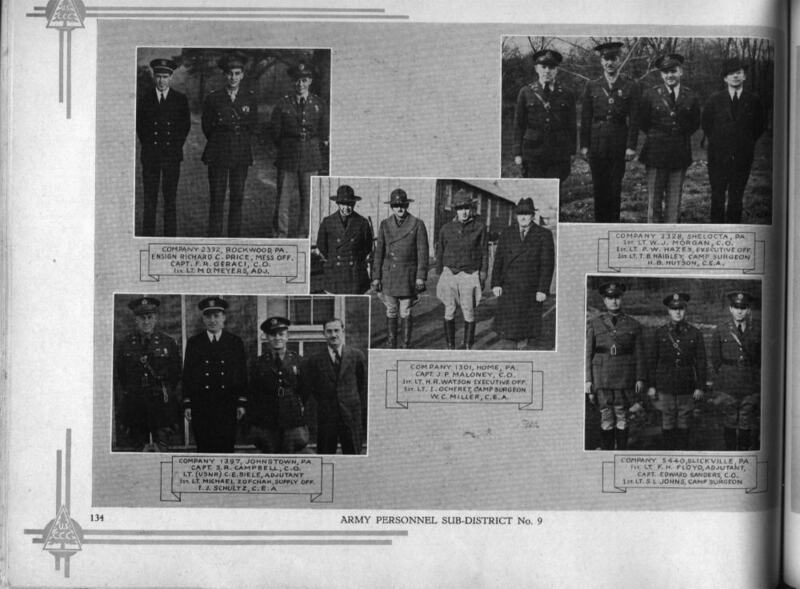 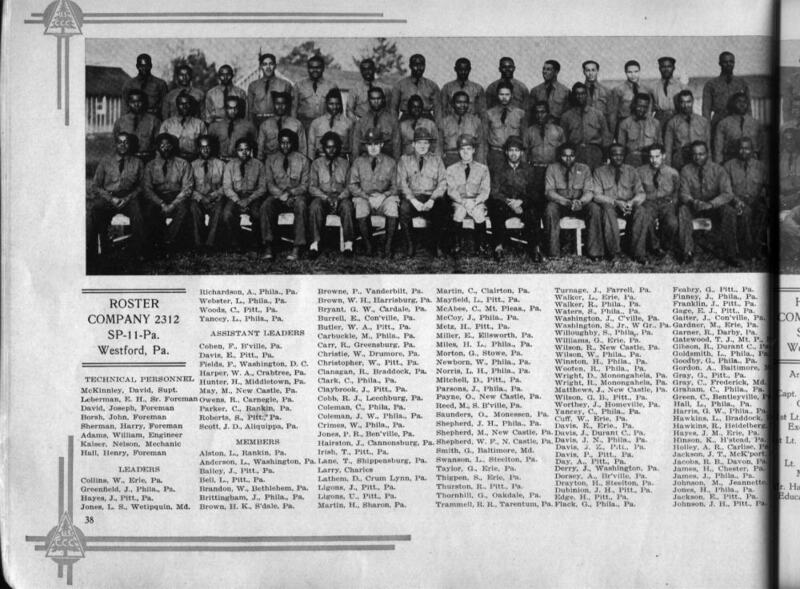 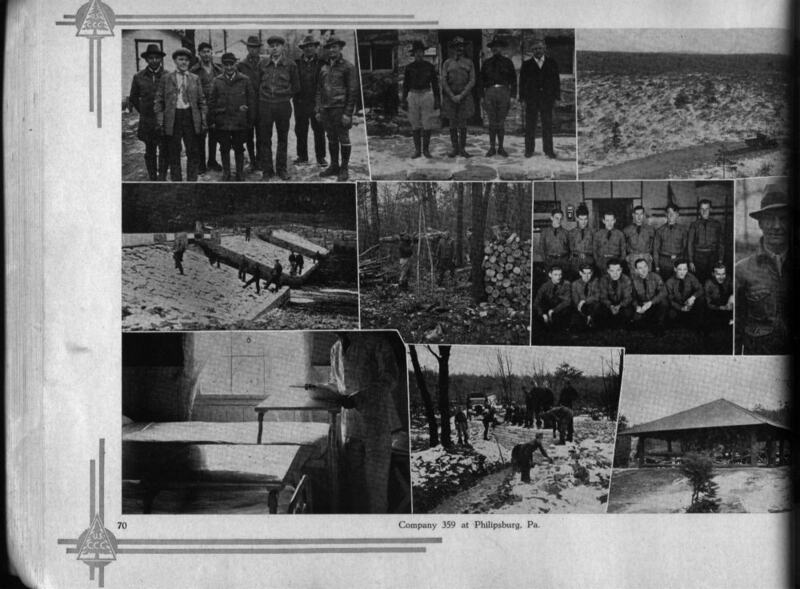 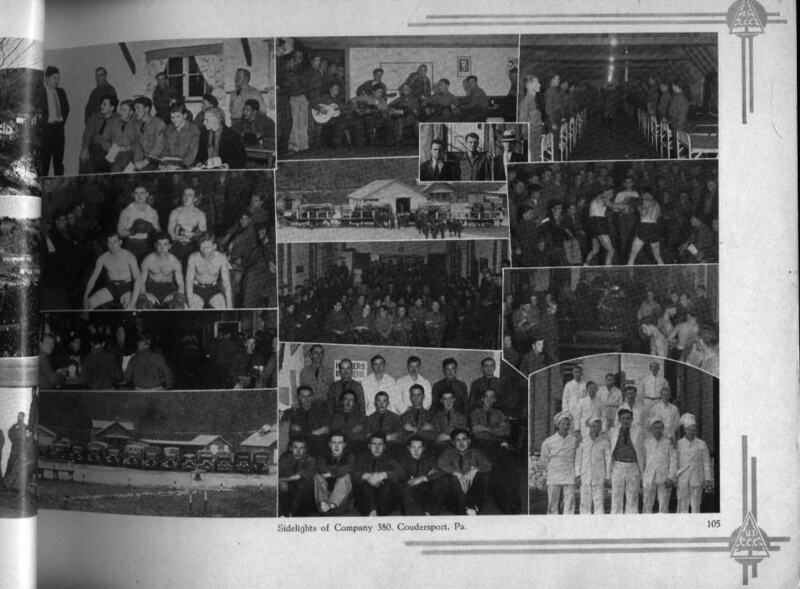 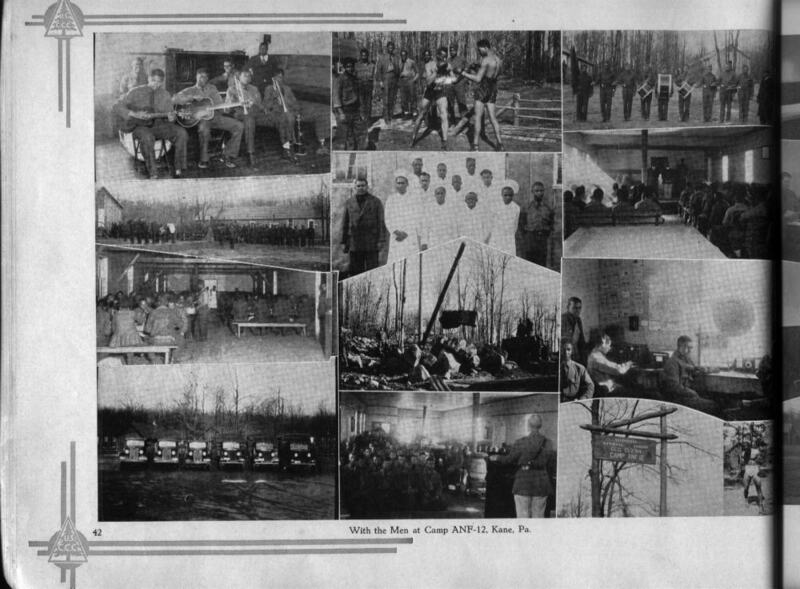 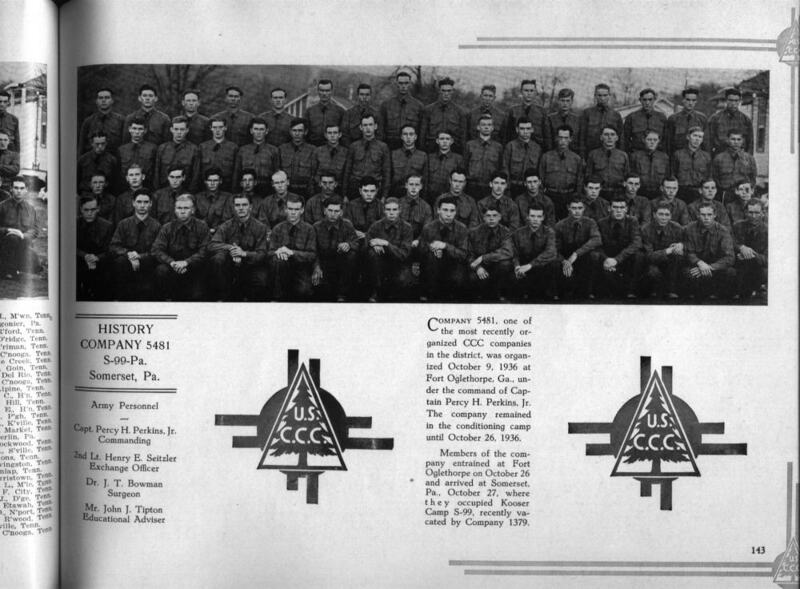 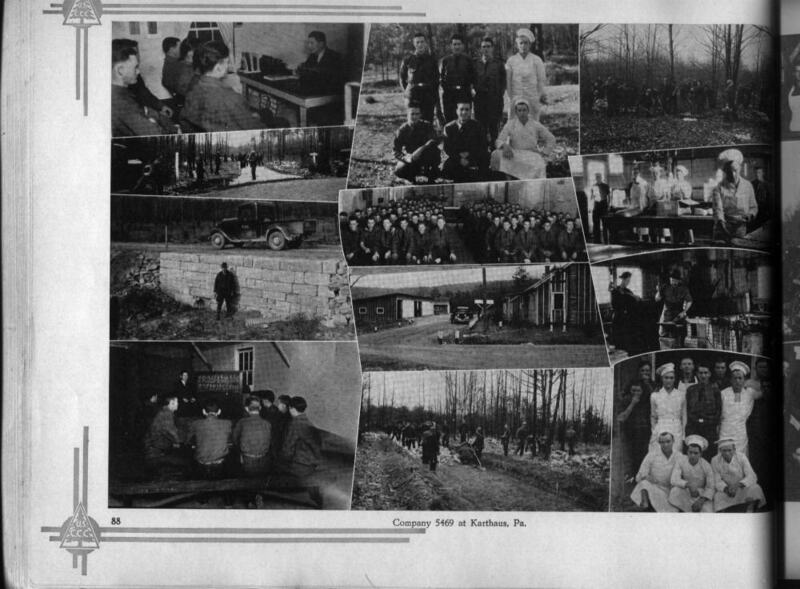 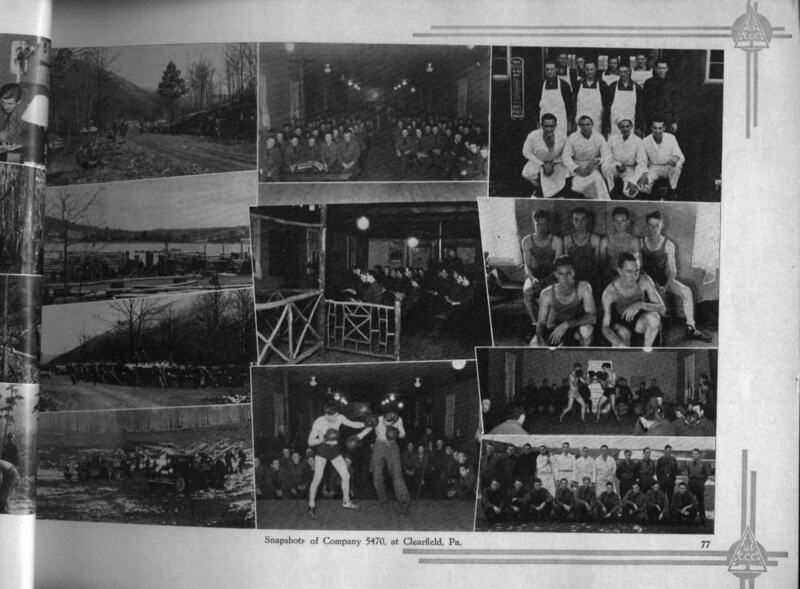 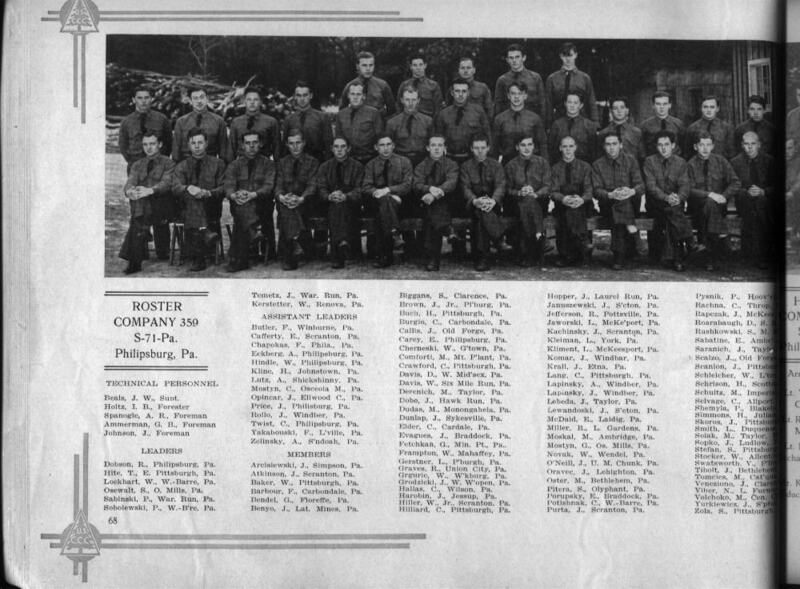 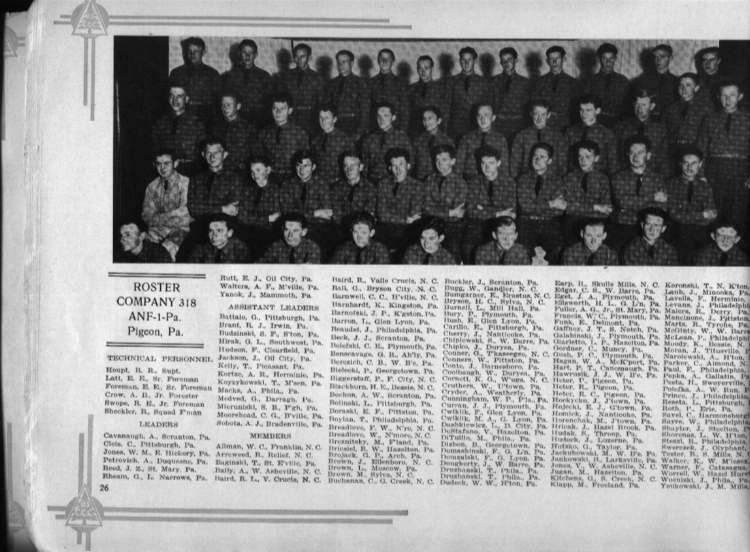 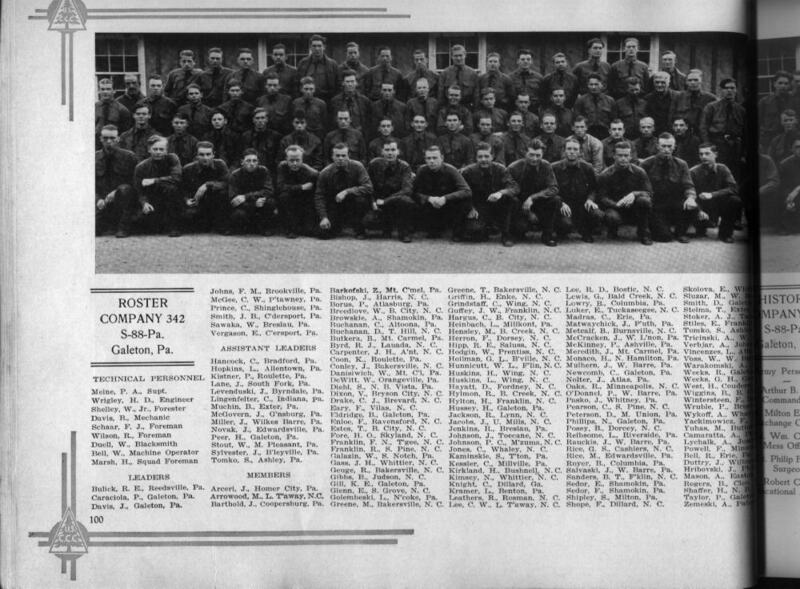 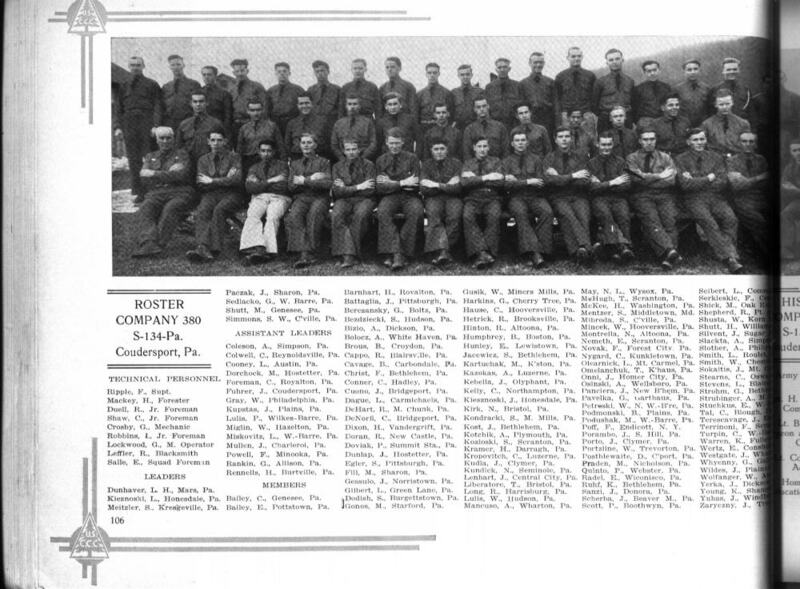 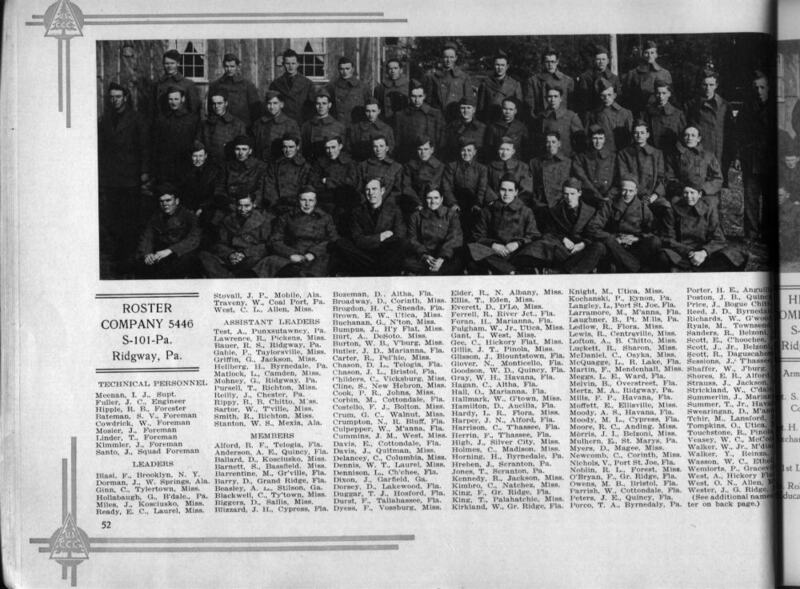 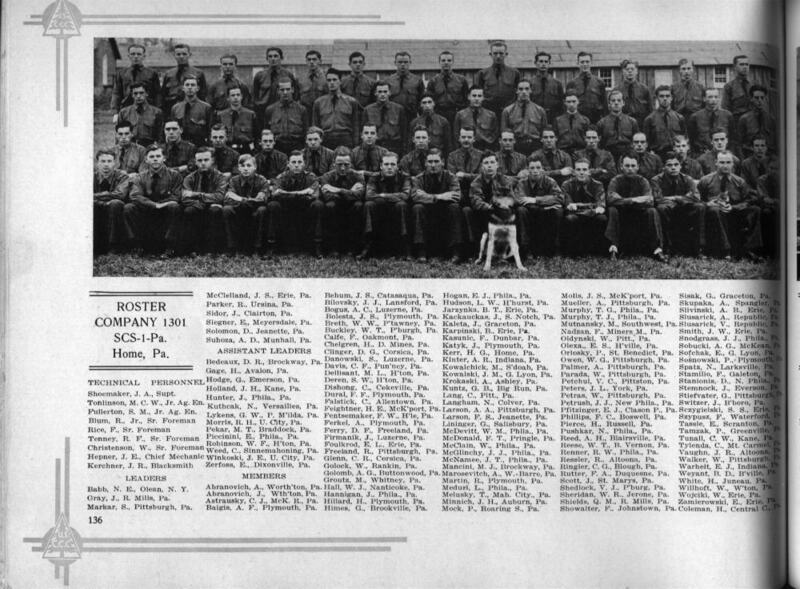 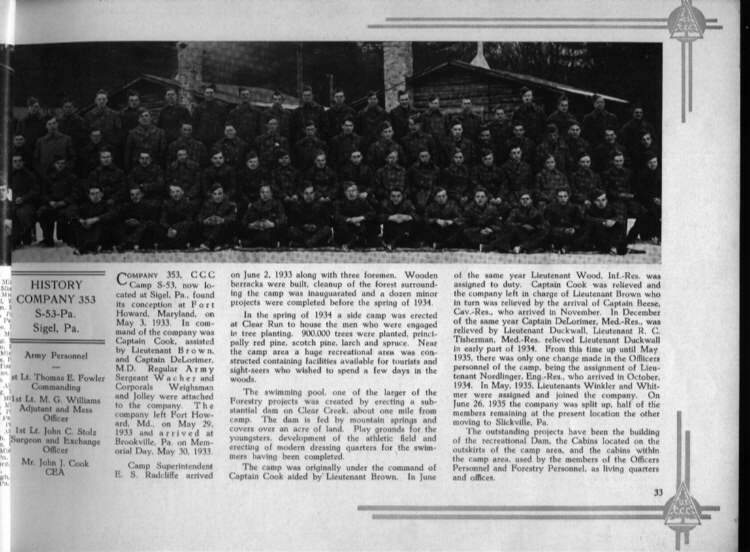 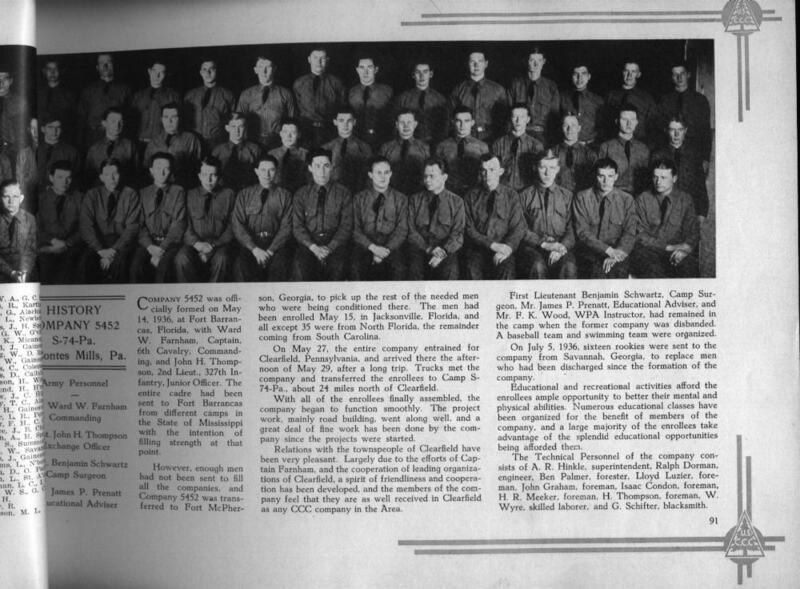 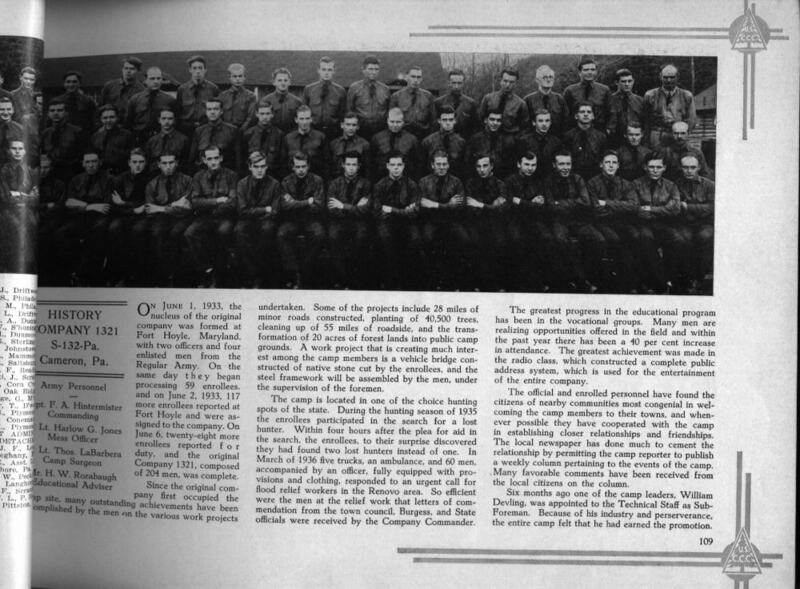 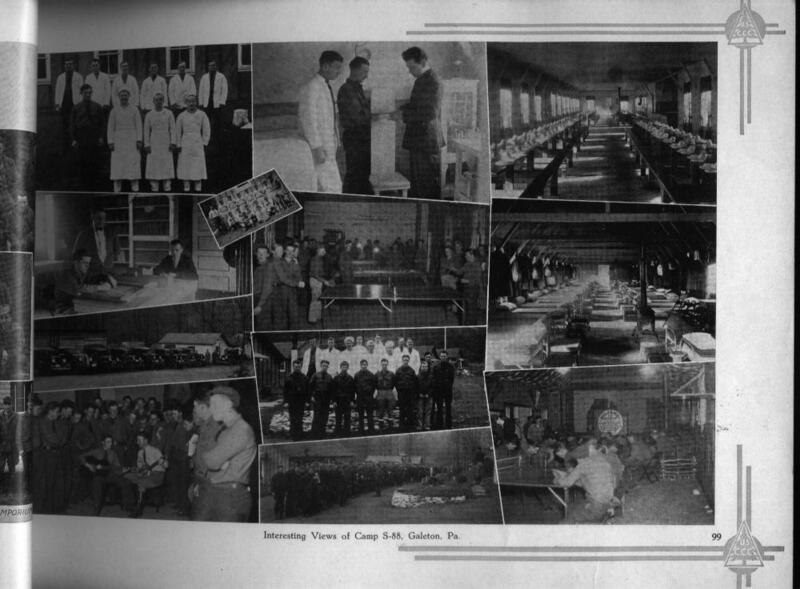 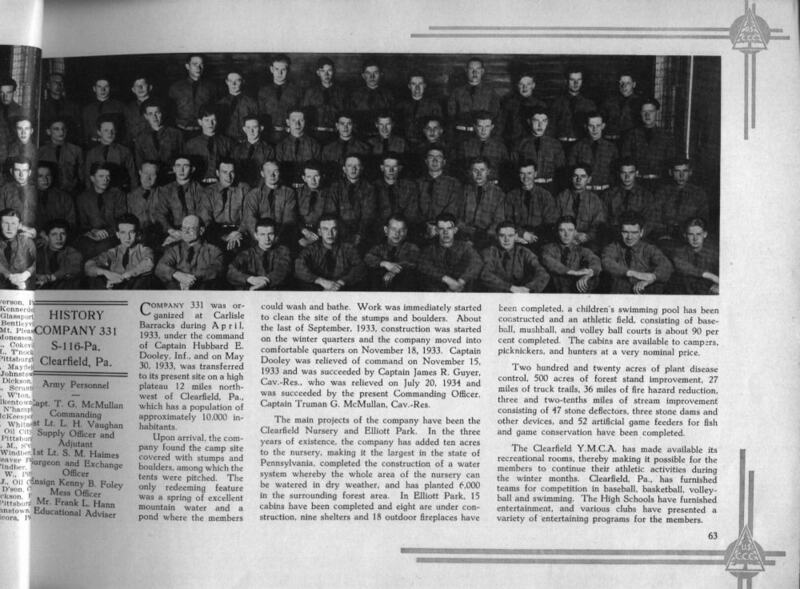 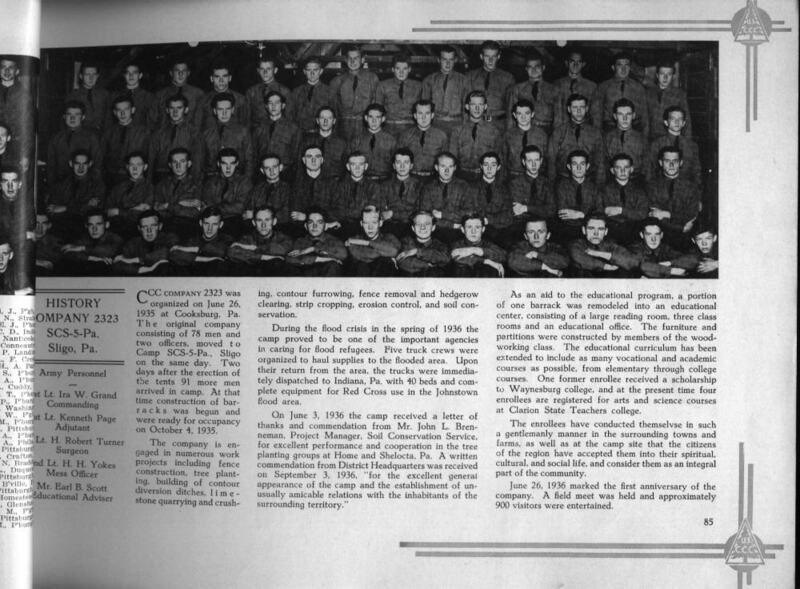 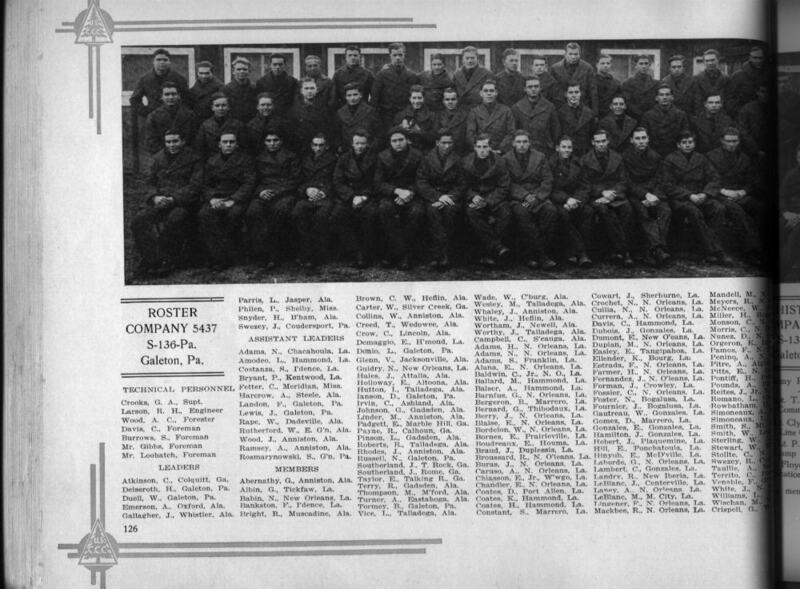 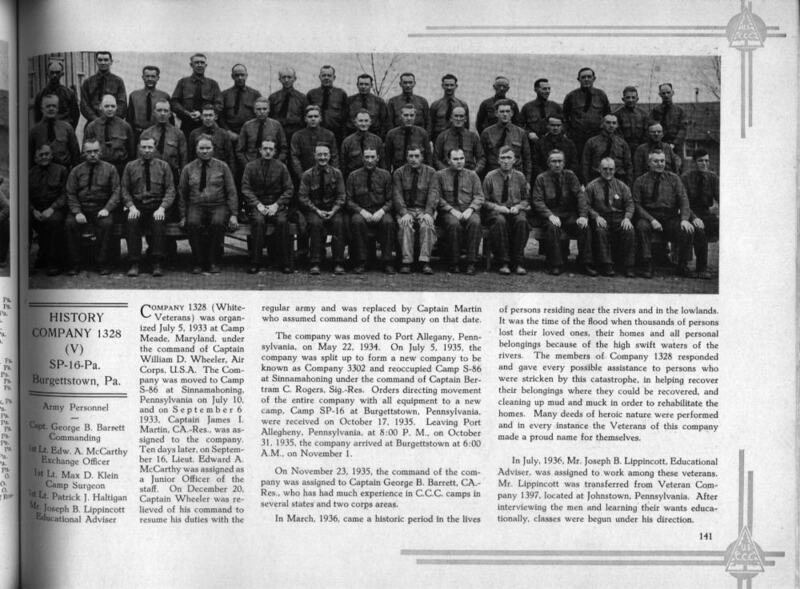 Snaps of Company 1397 (V) at Johnstown, PA.